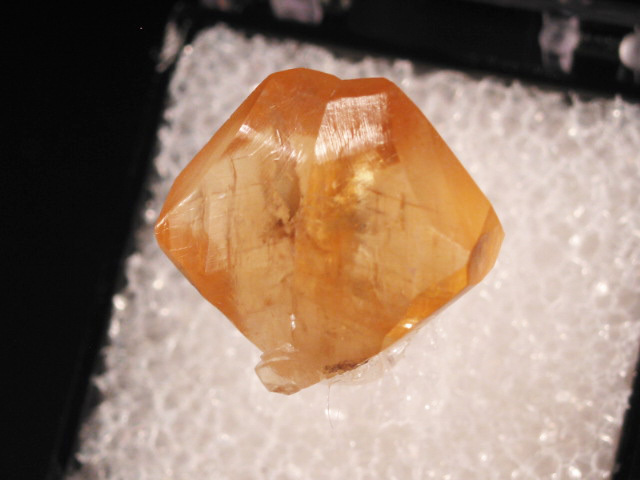 Whether at a small show or on a foreign buying trip, I always keep an eye out for a good thumbnail-- sometimes that means trimming a bigger piece, and sometimes it's already sized perfectly. 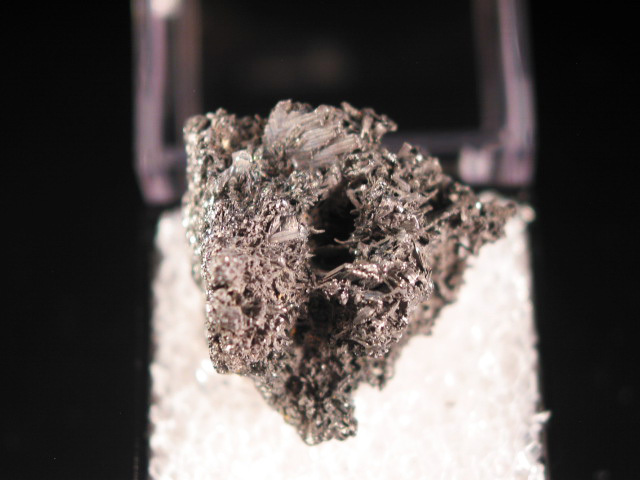 I mount hundreds of these, this is a small group that for whatever reason, I thought were particularly nice. 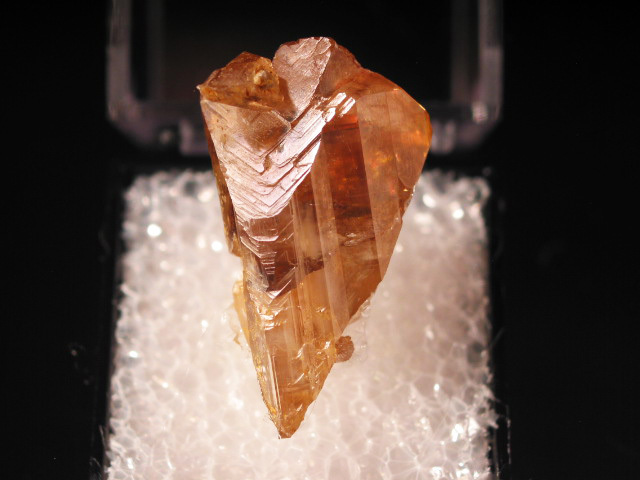 A nice little pair of intersecting topaz crystals from Mexico. 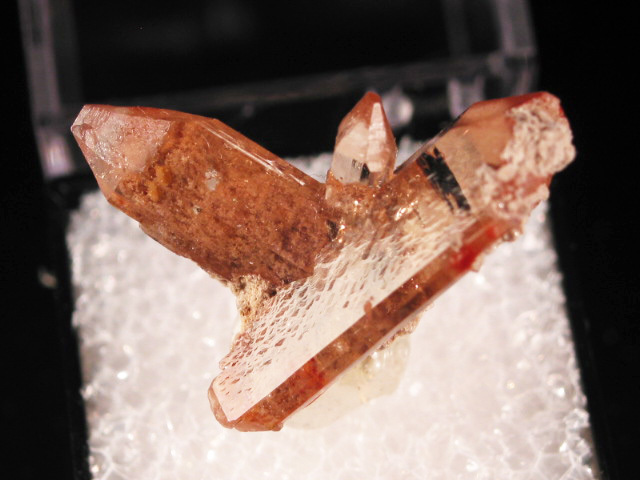 The appearance of this cluster is closer to examples from Utah, than the typical Mexican piece-- the mexican ones tent to have flattened terminations and reddish inclusions. 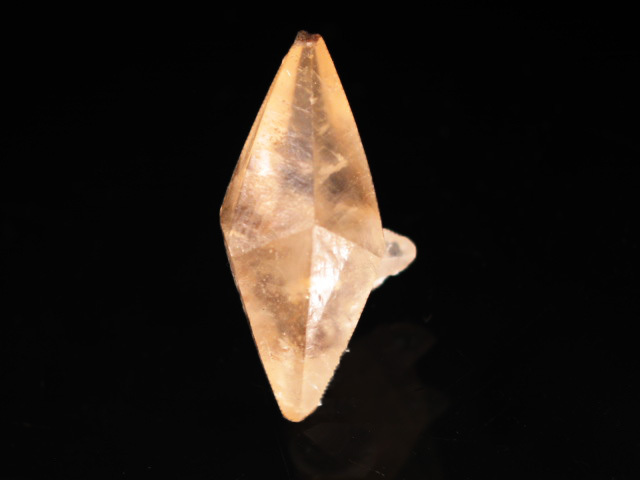 I bought a bunch of these as a group, this was my favorite. 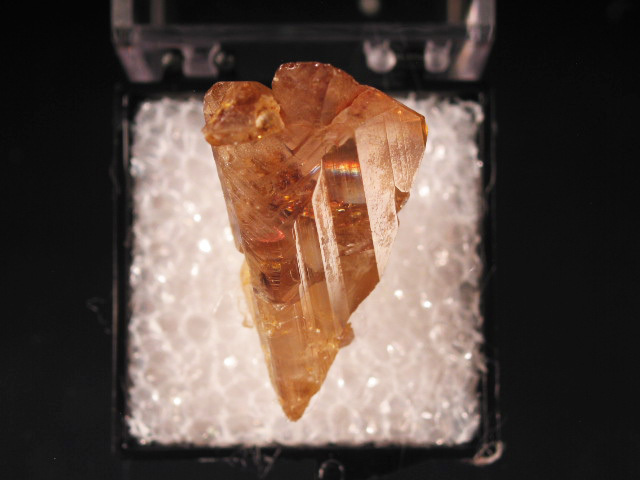 A very nice, doubly terminated gemmy crystal of barite from the Linwood Mine. 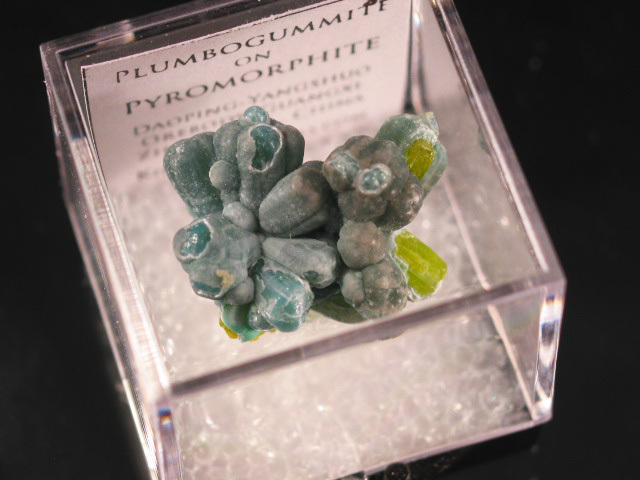 This is about as good as thumbnails can get from here.... yet still relatively inexpensive. 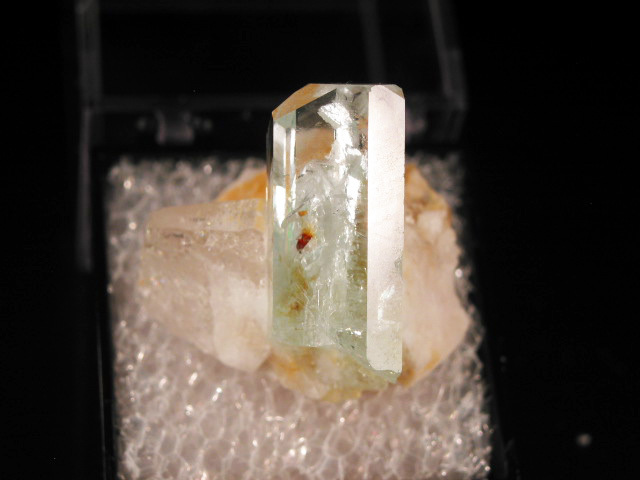 A nice gemmy aquamarine crystal on a bit of matrix. 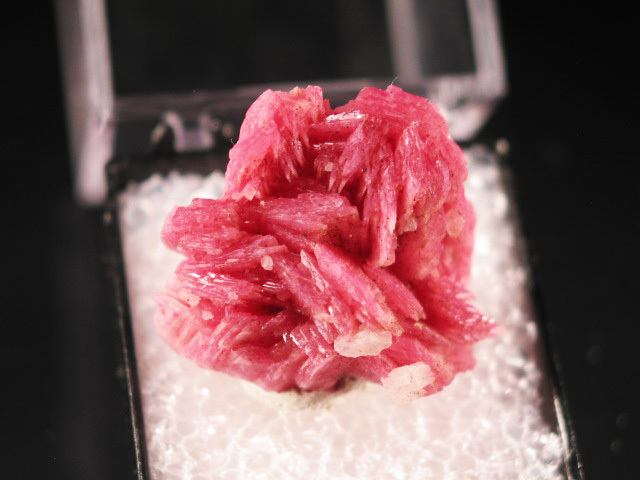 A nice specimen of fairly saturated pink rhodonite. 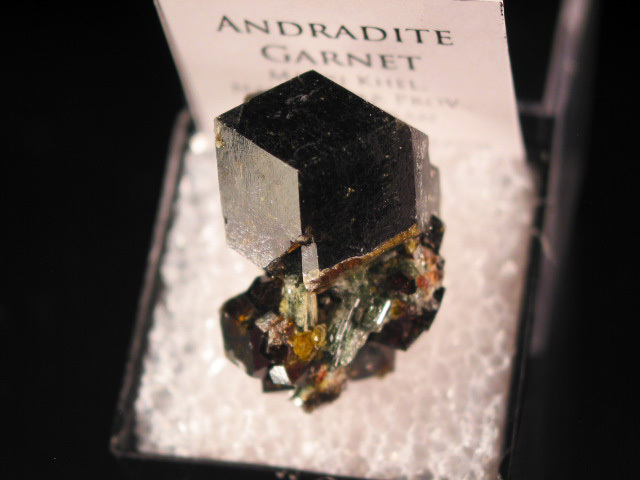 To the best of my knowledge, the main rhodinite finds at this location took place once around 1989, and a second time around 2006. 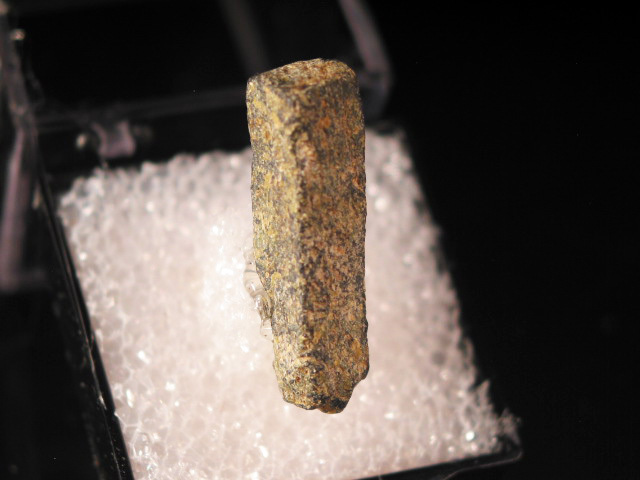 This piece comes from the 2006 find. 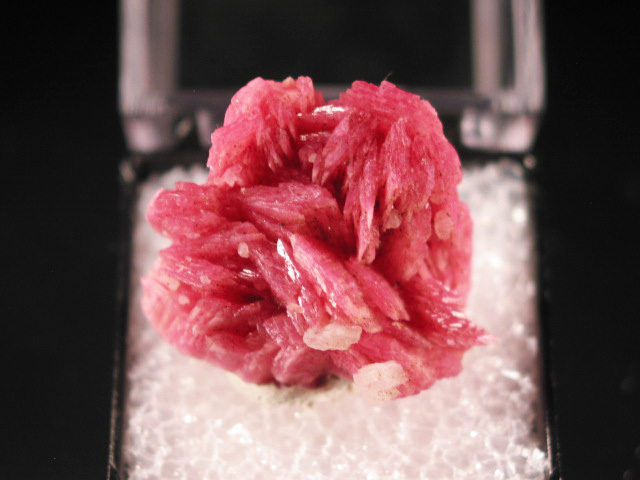 There are really only 4 localities form which you can (have a reasonable chance of) find(ing) good rhodonite: Chiuruc (where this one is from), Conselheiro Lafaiete in Brazil (the most recent find), Broken Hill, Australia, and the old pieces from New Jersey. 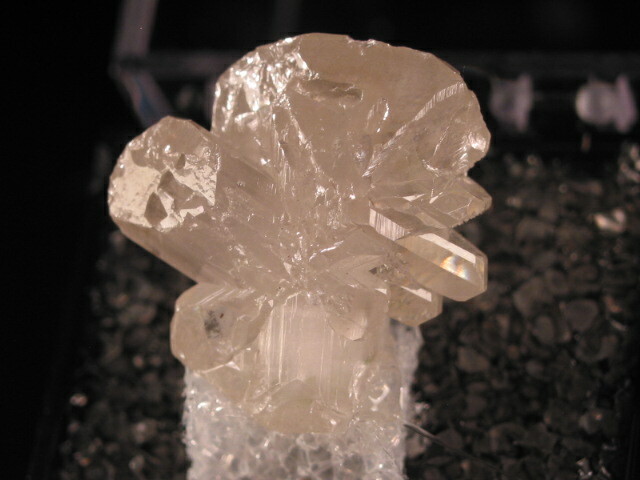 A very beautiful colorless and reasonably transparent calcite crystal from the Linwood Mine. 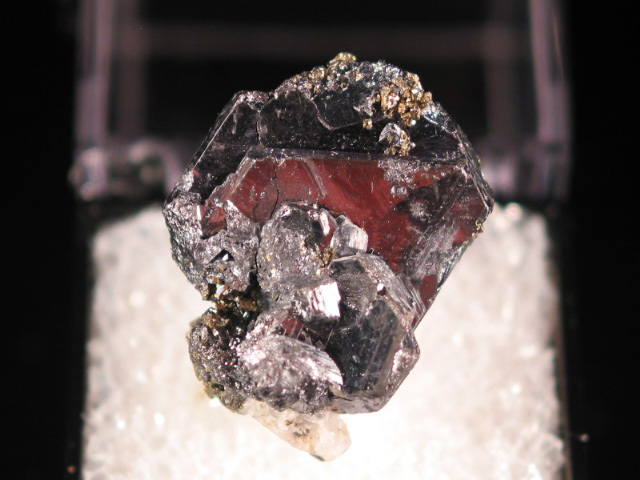 Most of the examples from this mine tend to be very large-- to find such a perfect thumbnail takes a bit of looking. 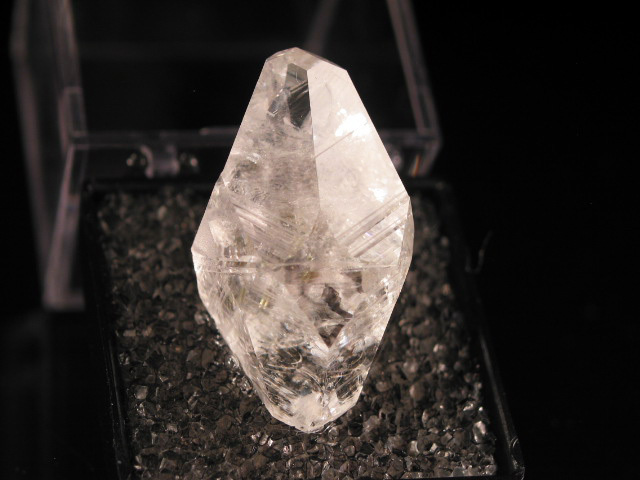 You could probably get a much bigger (and more imperfect) example for this price.... but I really like this one. 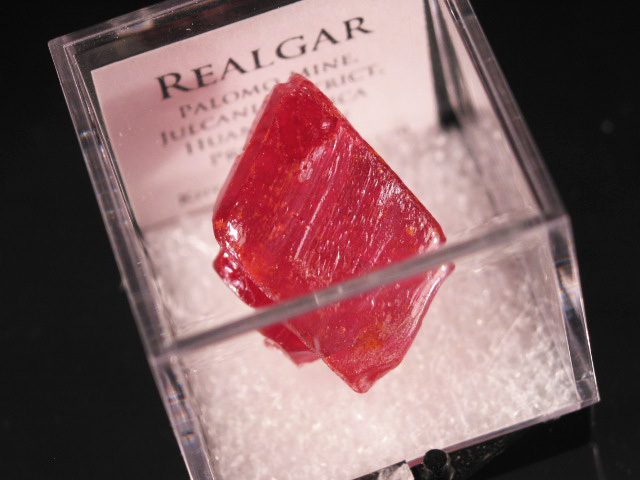 A nice specimen of realgr from Peru, showing the bright red color and excellent form. 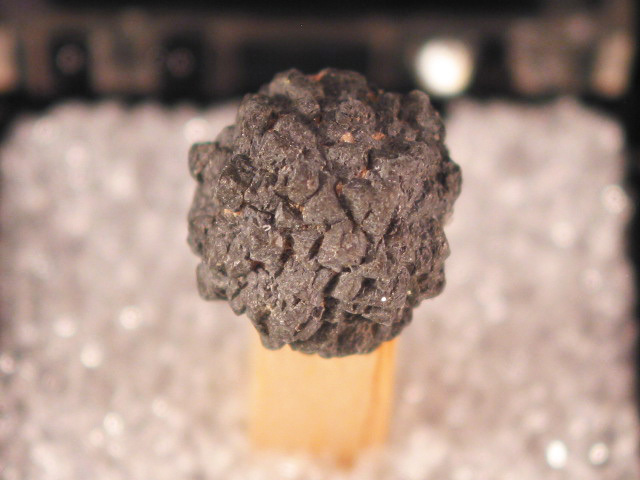 There is a chip near the top. 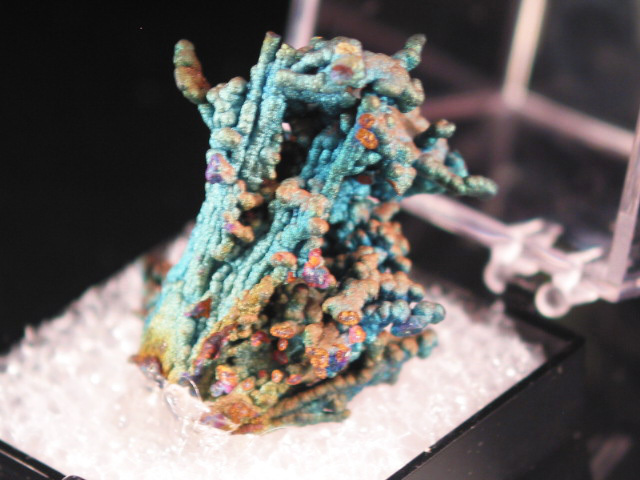 I have coated this with a UV absorbing spray. 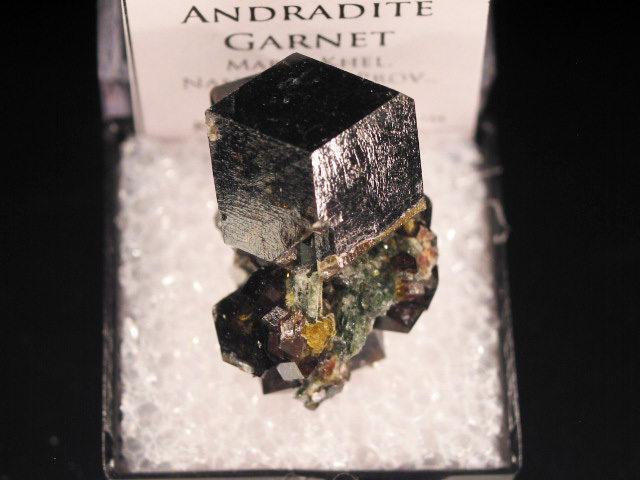 A cluster of large, semi-flattened olive colored garnet crystals on a bit of matrix. 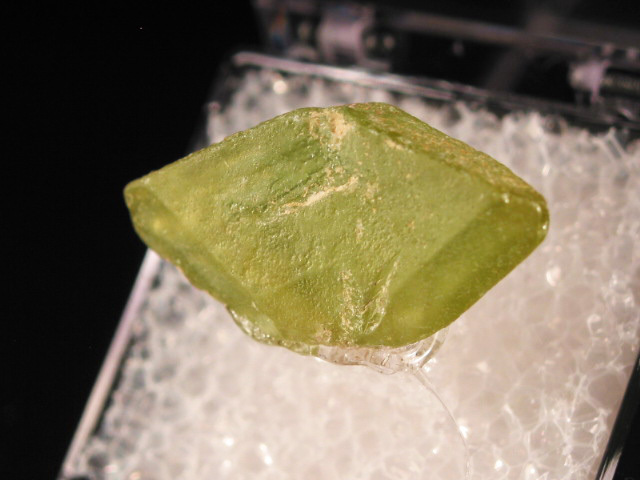 The matrix is actually an aggregate of micro demantoid garnets-- not sedimentary material as was originally thought. 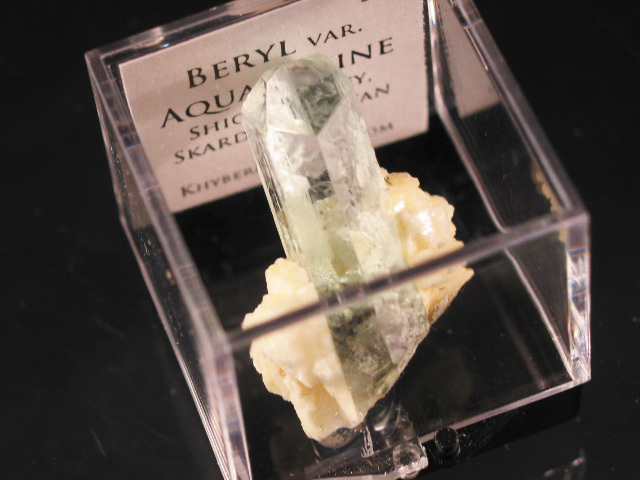 The story behind these is that a fisherman spotted a few small glistening gems in a mangrove swamp. 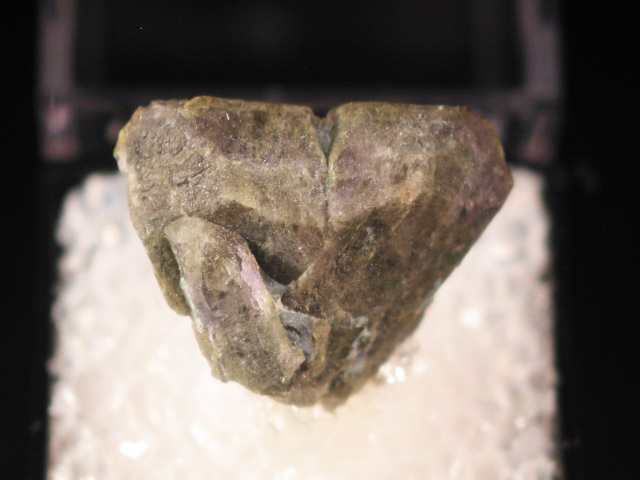 Within a matter of weeks, the place was overrun by artisanal miners looking to strike it rich-- and needless to say the mangroves were destroyed. 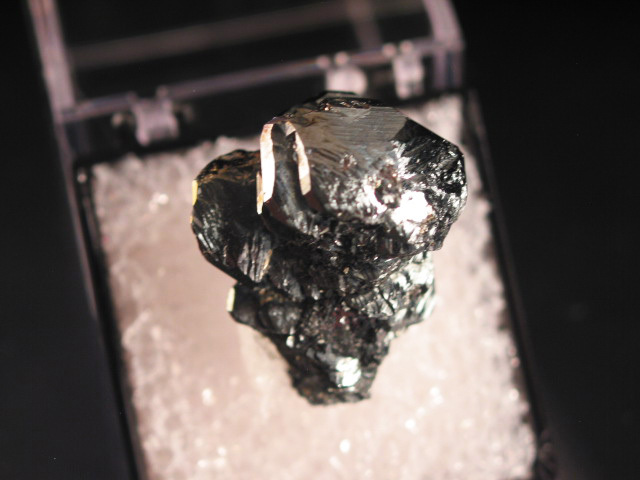 Miners would come and go with the tides, pausing and resuming work as their claims were flooded on a daily basis. 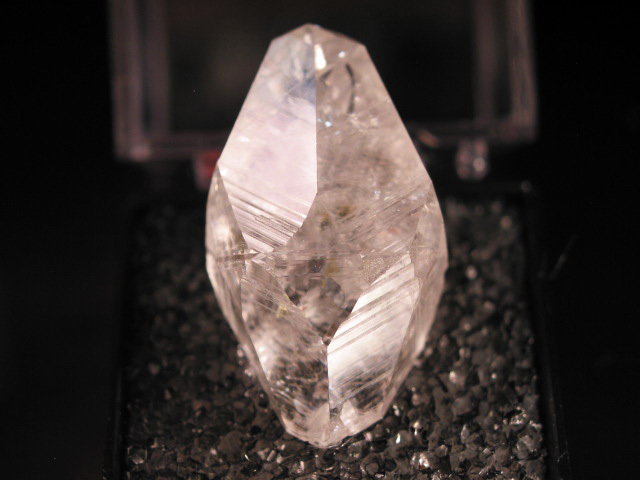 Digging went on for a couple years, and is now finished. 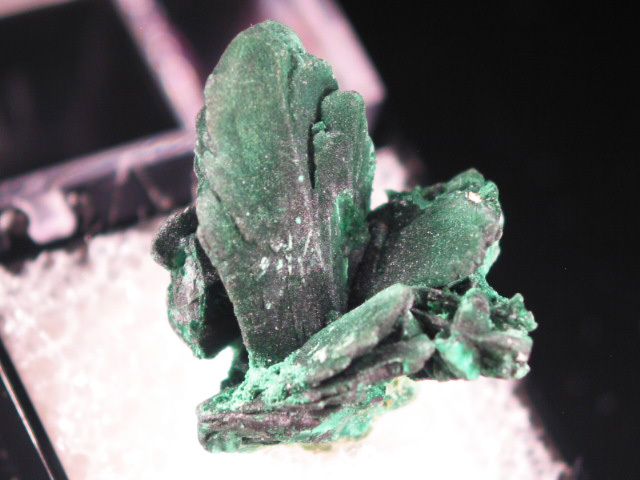 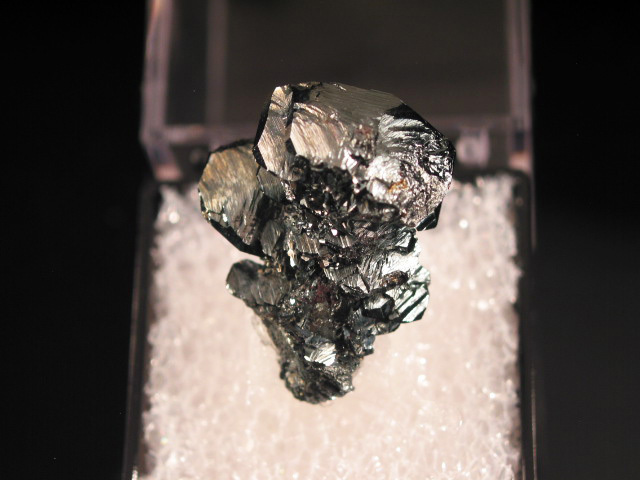 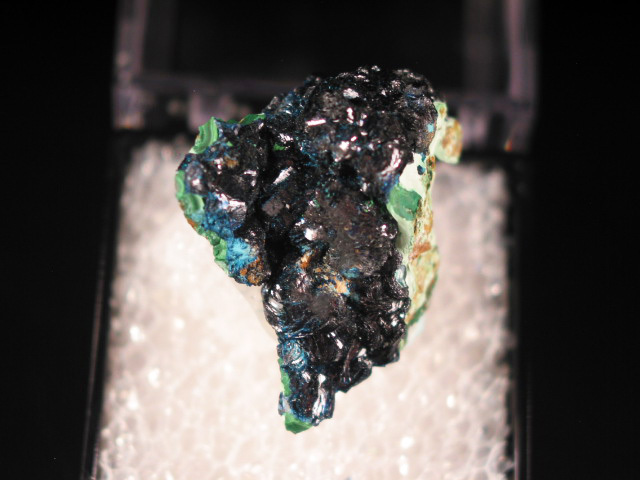 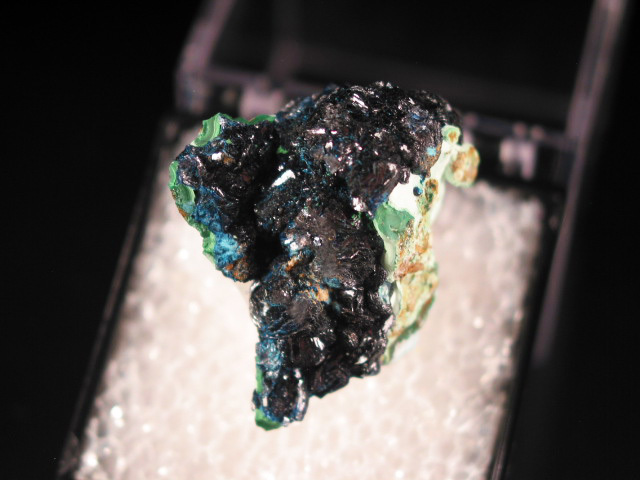 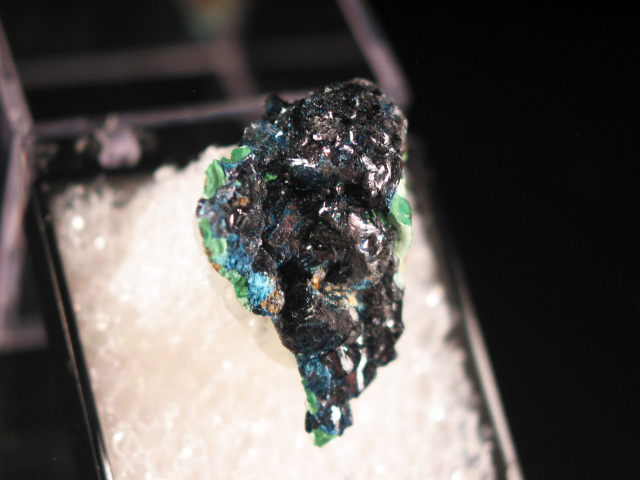 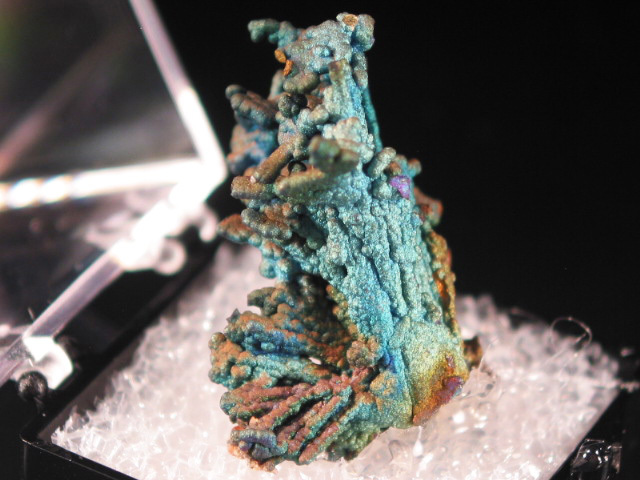 A nice thumbnail of chalcocite from Wisconsin. 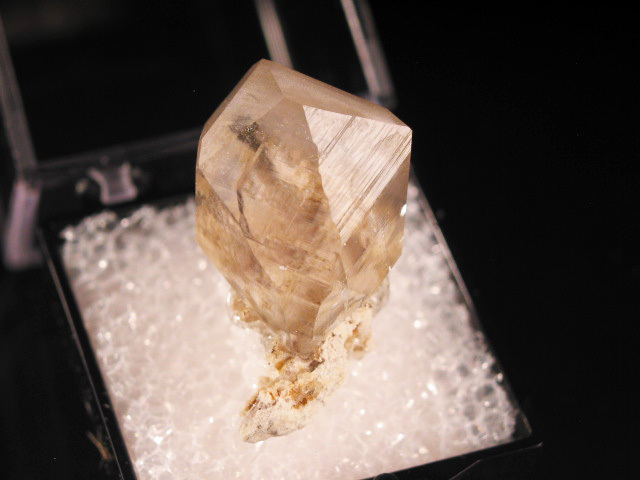 The main crystal is not terminated, though this is nor readily apparent, and it shows better crystal faces than most of these, which tend to look kind of messy. 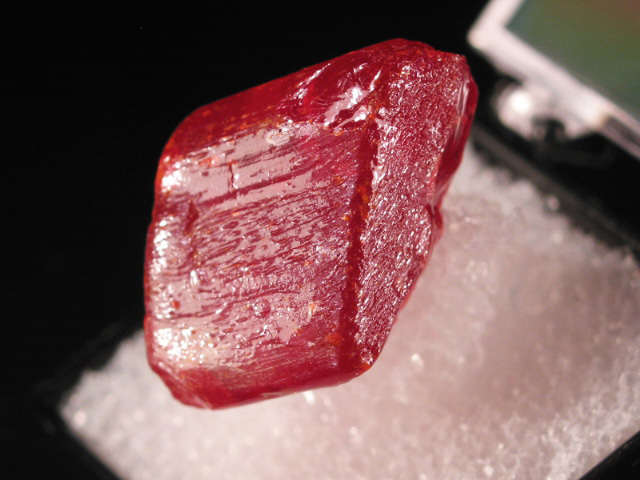 Not bad for the price. 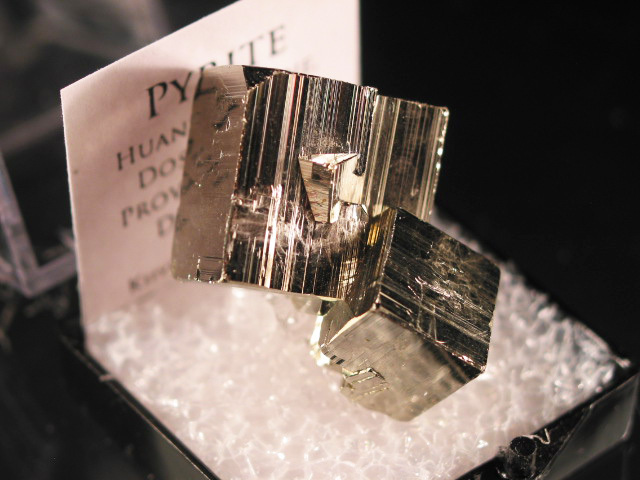 A very beautiful little thumbnail of pyrite from Huanzala. 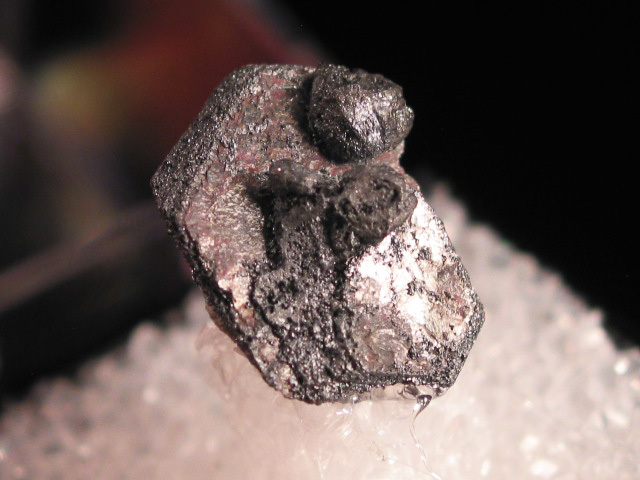 In previous years, this stuff came out by the ton, sometimes in gigantic chunks. 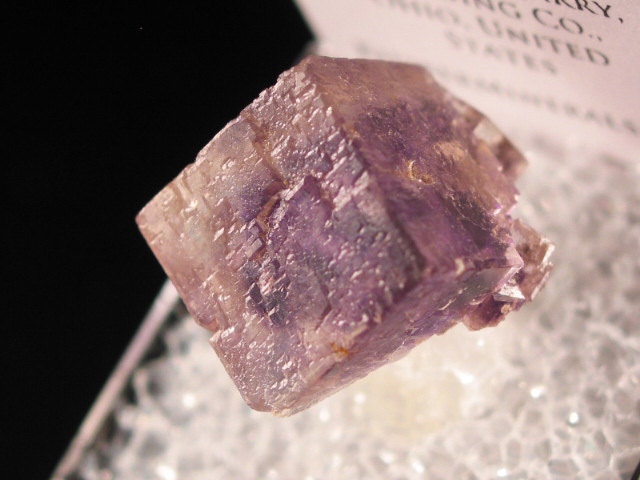 This one is just a beautiful little mini-- with excellent luster, sharpness, and form. 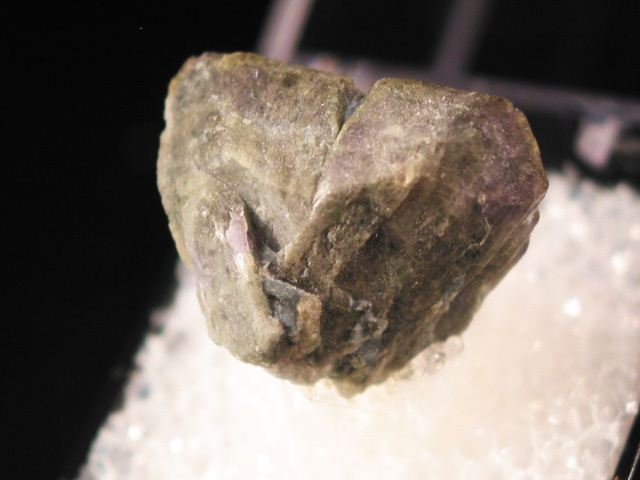 There is minor edge chipping visible under magnification, but to the naked eye it is quite beautiful. 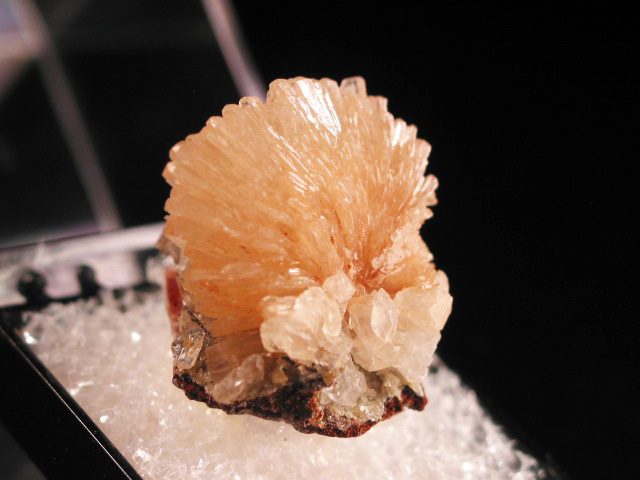 A beautiful twined crystal of calcite from the Irving Materials Quarry. 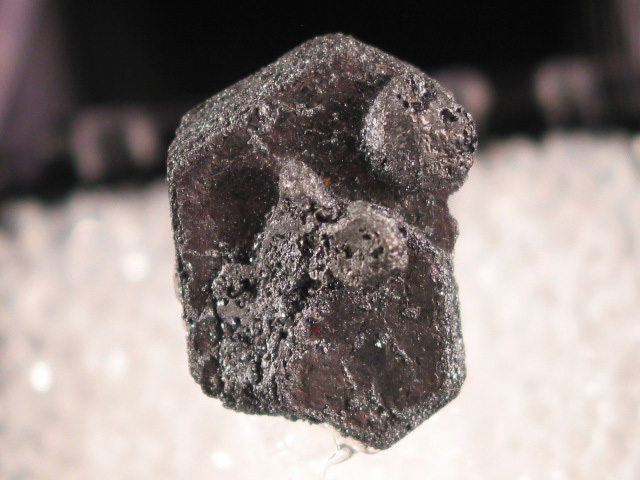 Along with the rounded examples from the nearby Berry Marterias Quarry, these are my favorite American calcites, even if they are smaller and less well known that examples from, say, Elmwood. 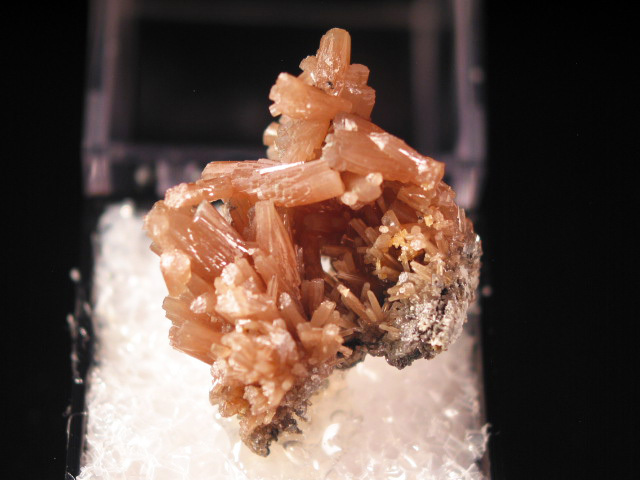 The American midwest is home to various aggregate quarries, many of which produce their own unique habits of calcite. 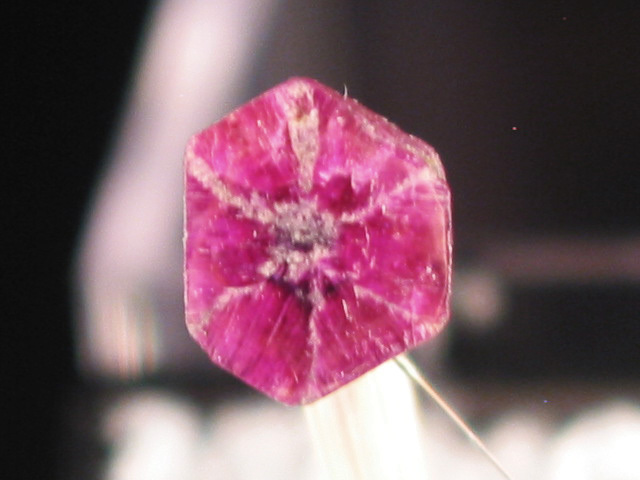 Most of these don't make it to the international shows, being largely the domain of local field collectors. 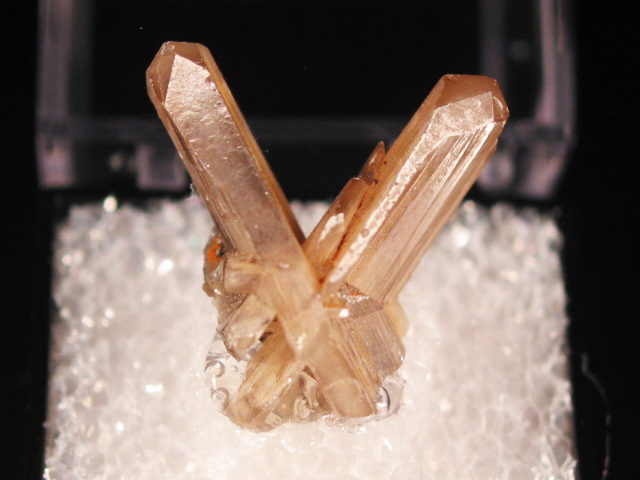 A nice cyclic twin of cerussite forming a nice little sixling or "snowflake" from the classic Tsumeb Mine. 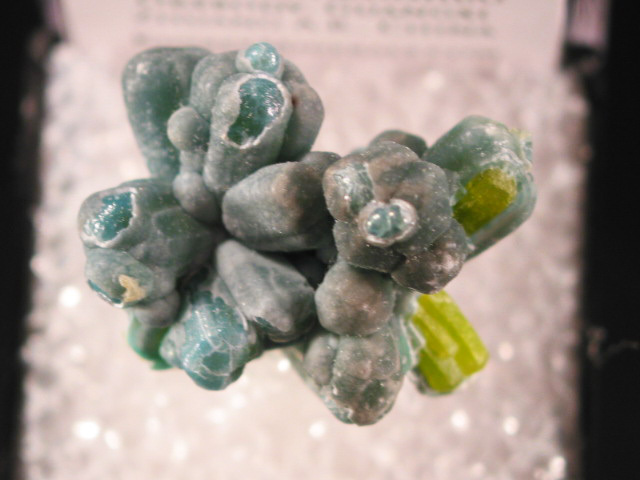 A nice specimen of blue plumbogummite coating green pyromorphite crystals-- the green is only visible ina couple spots where the plumbogummite coating is gone. 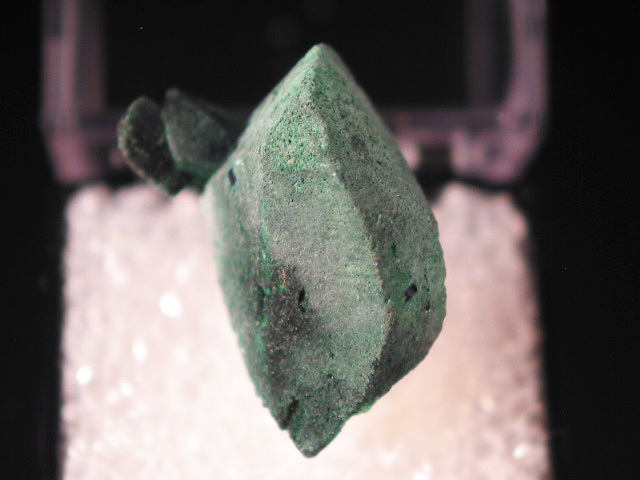 Pretty good form for this material. 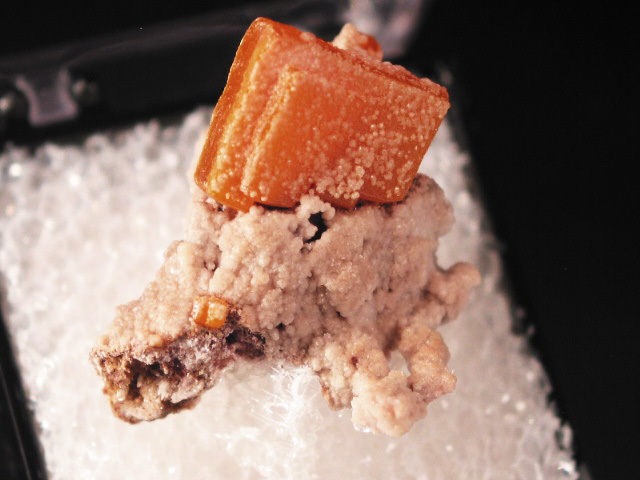 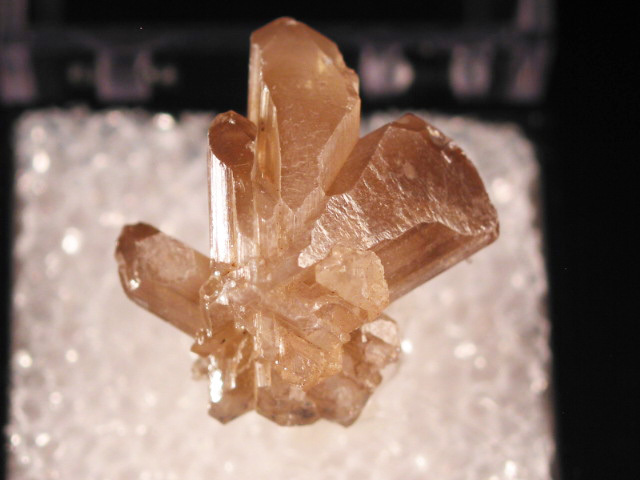 A nice sample of barite from colorado, with a single, water-clear crystal on a bit of matrix. 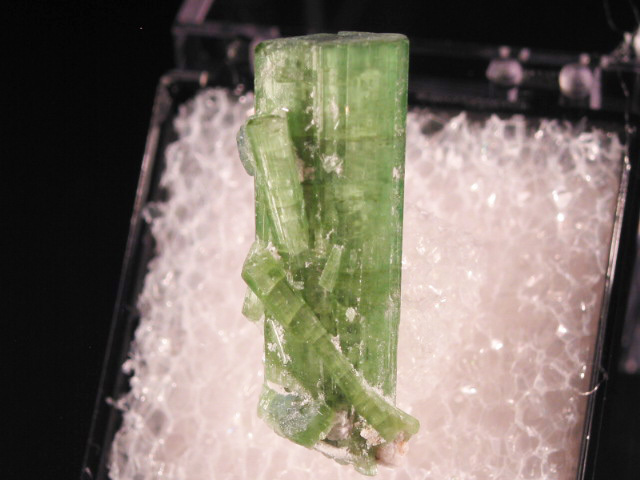 A beautiful terminated green crystal of tourmaline, from Pakistan. 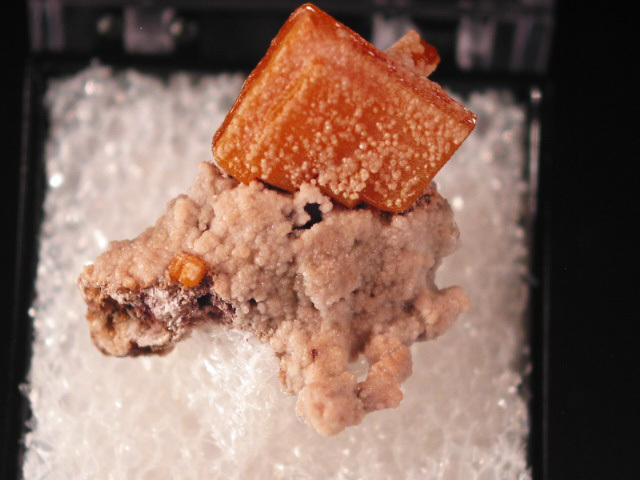 A beautiful little thumbnail of calcite from the Linwood Mine. 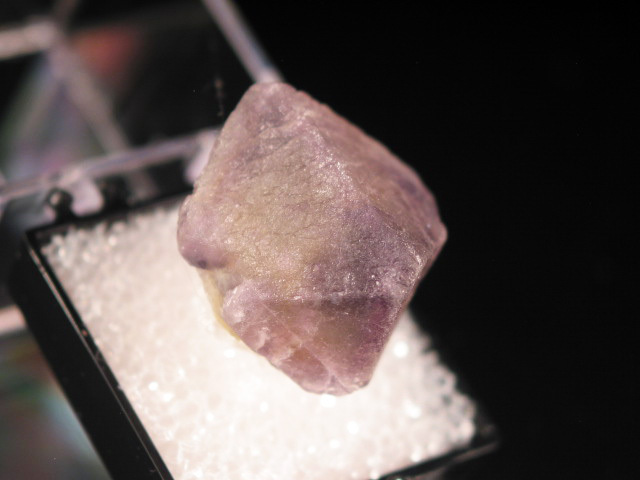 These tend to be offered as larger specimens, to find a perfect little thumbnail takes a bit more looking. 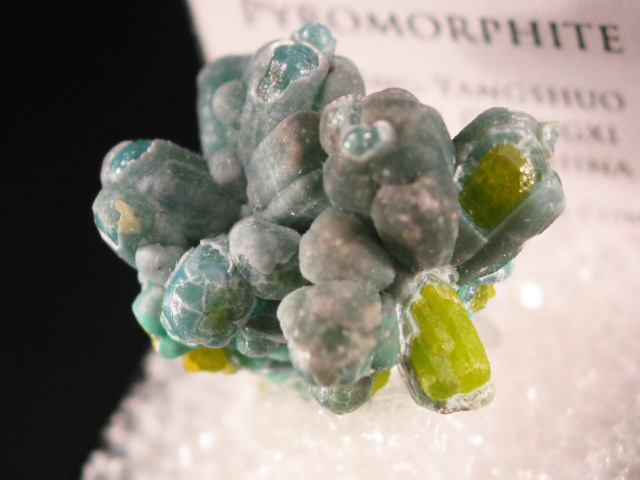 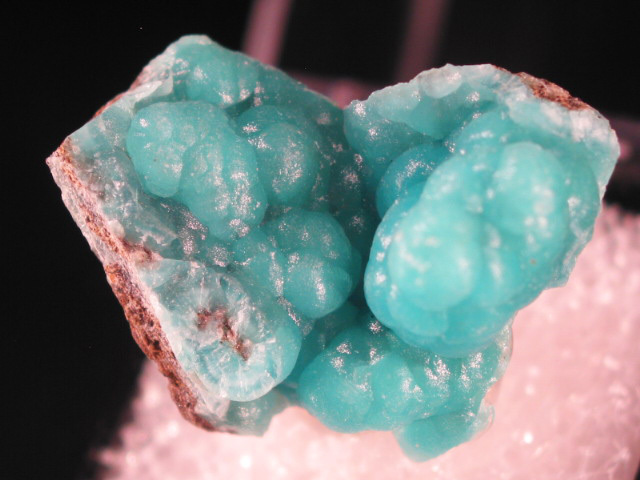 A beautiful fan of hemimorphite crystals on a bit of matrix. 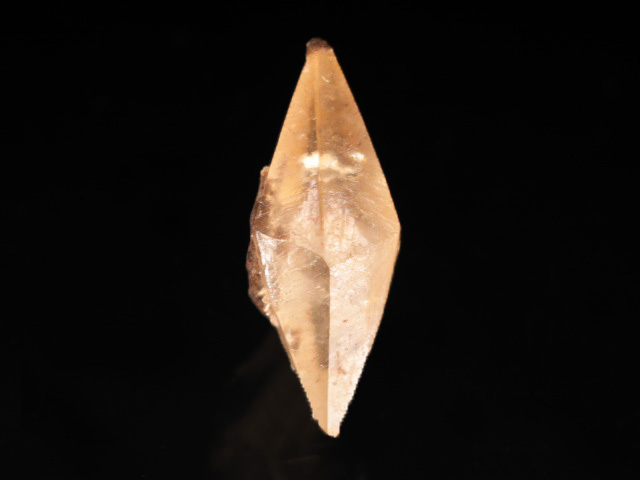 Excellent form. 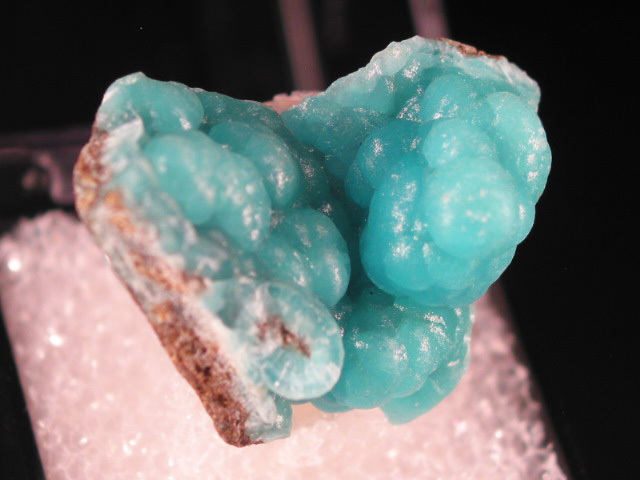 A very rich little thumbnail from the Majuba Hill Mine in Utah. 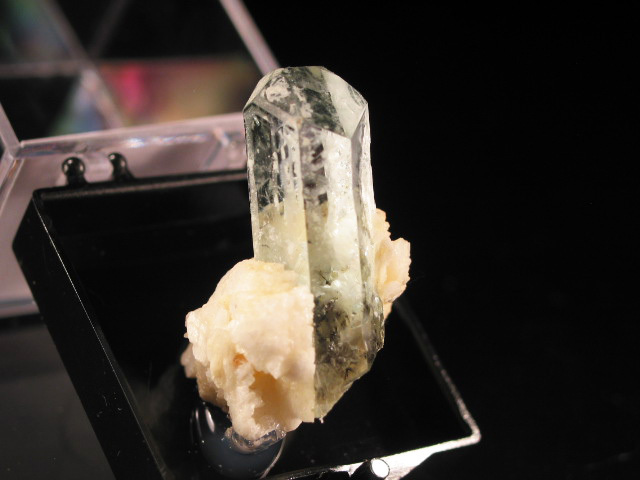 After the old Cornish specimens (that are nearly unobtainable, and much more expensive) these are probably the best ones around.... and this is a particularly good thumbnail. 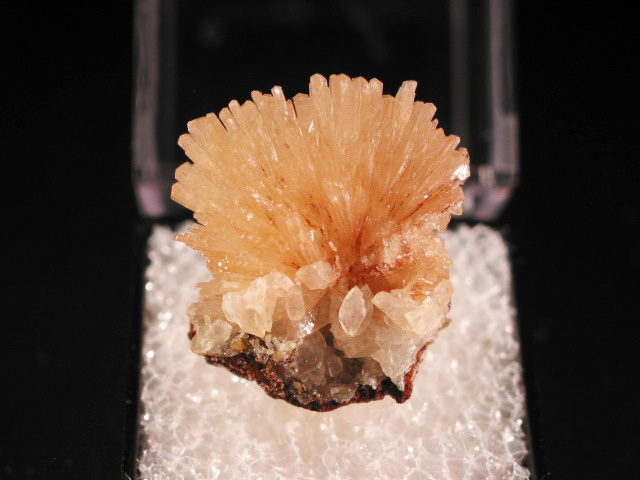 A very rich thumbnail specimen of this absurdly delicate mineral from Kentucky. 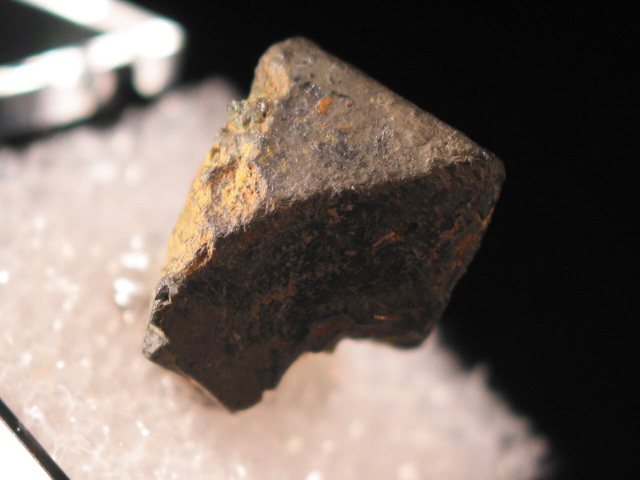 Ships with insurance. 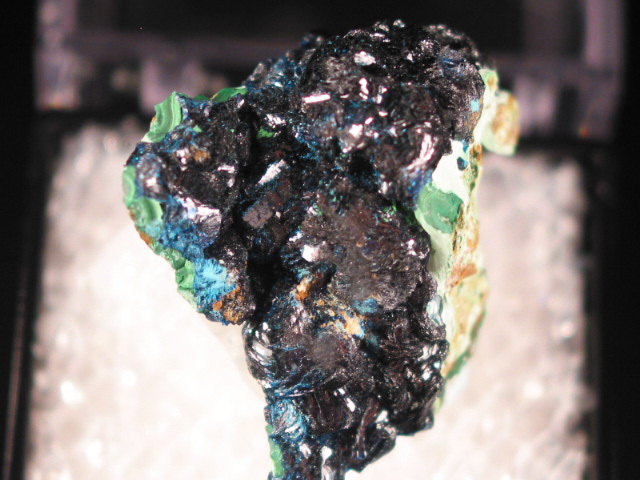 A beautiful iridescent example of stalactitic chalcocite coated with djurleite. 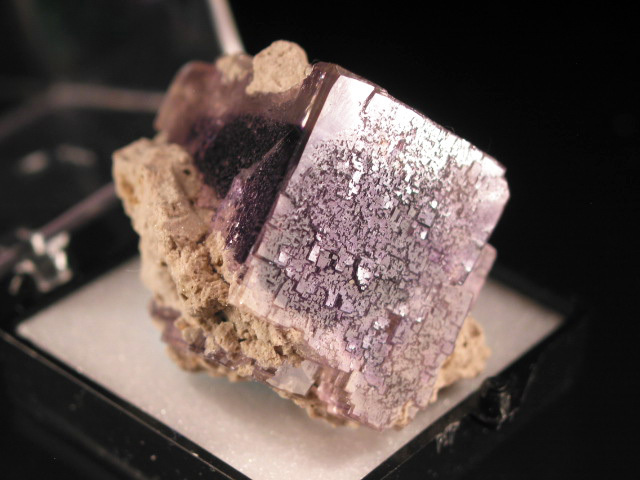 The djurleite gives it a beautiful metallic blue/ purple that is especially vivid on this piece. 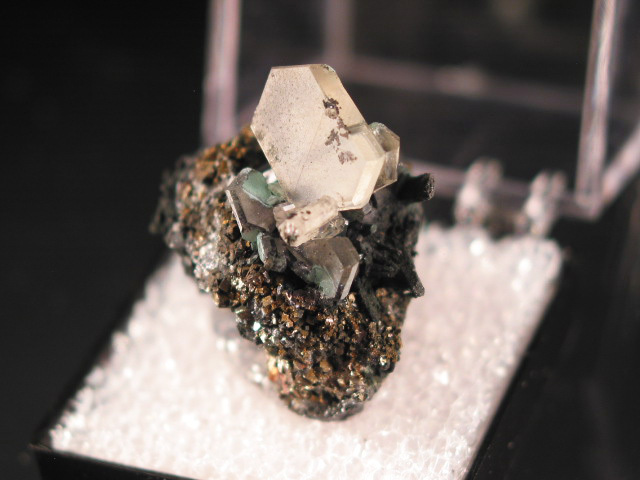 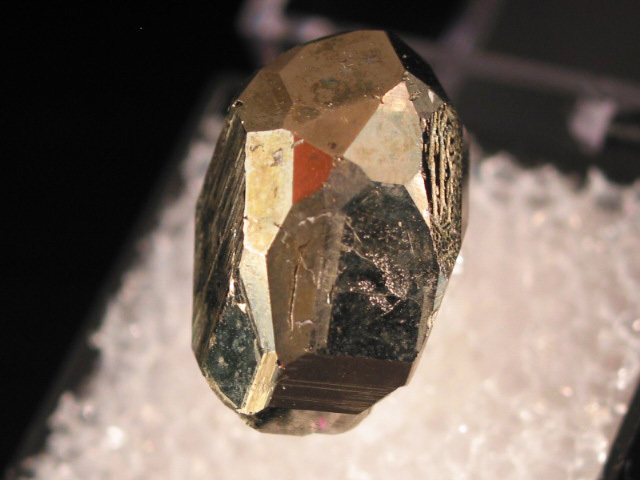 A rare thumbnail example of powellite, scheelite's rarer cousin. 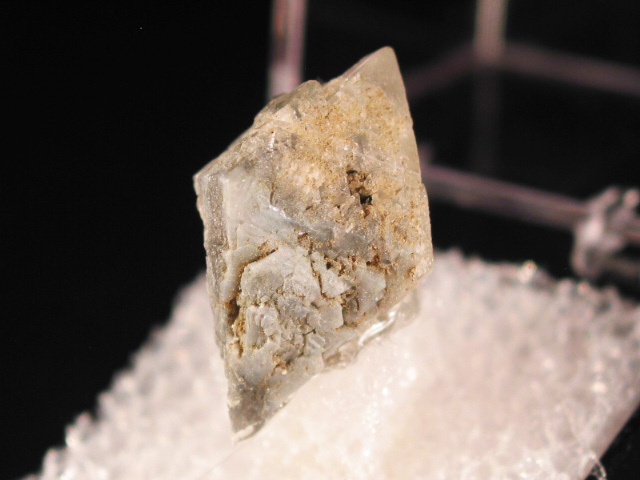 Powellite is one of the rarer minerals from the Indian basalt traps, and although is found in association with zeolites in this area, is not a zeolite itself. 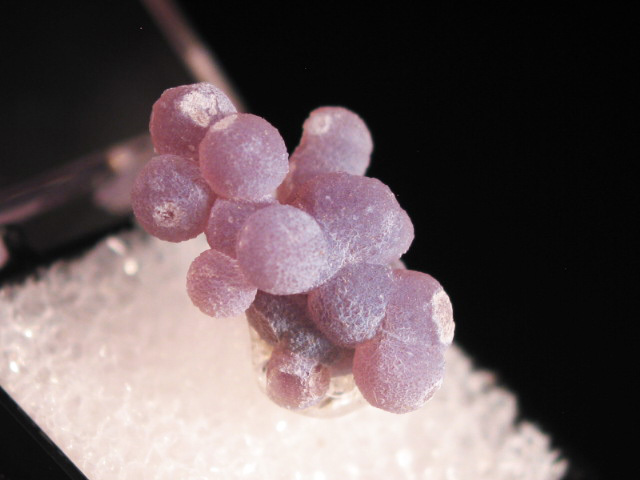 A nice little reference thumbnail of this interesting "grape agate" that was recently discovered in Indonesia. 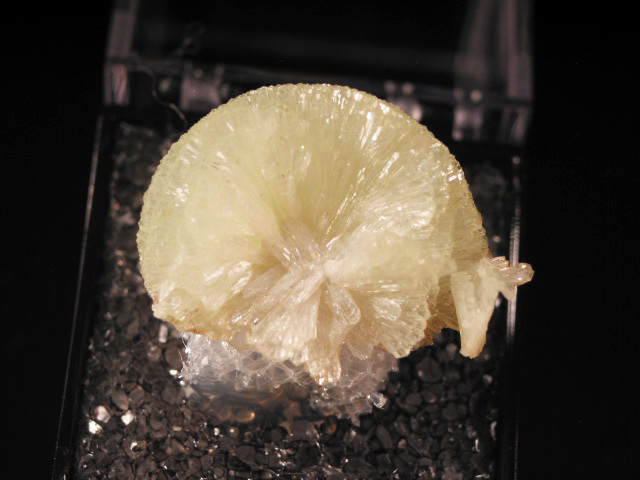 A nice ( and older) twinned cerussite crystal from the Touissit area of Morocco. 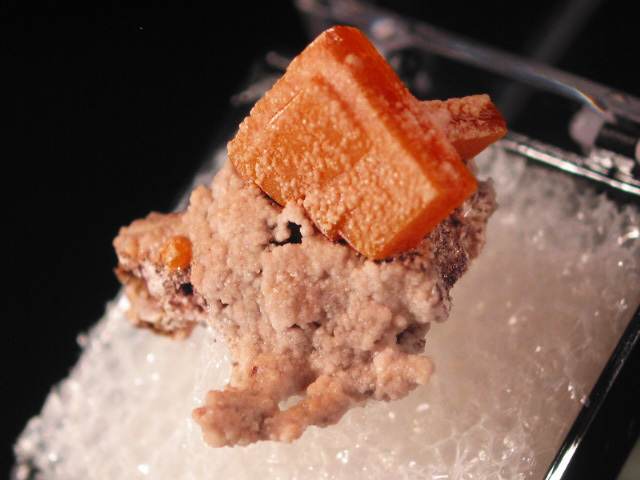 A nice blocky wulfenite crystal on a bit of matrix. 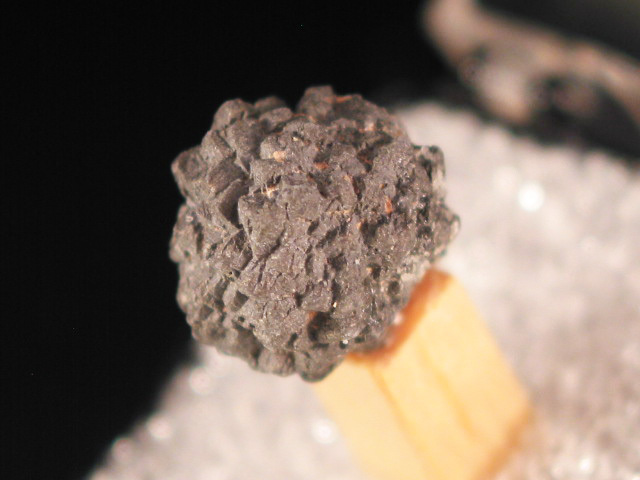 A very pretty and well balanced little thumbnail from older finds at this location. 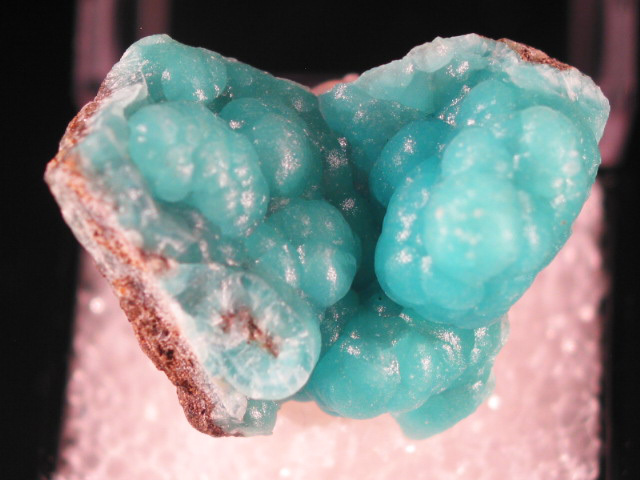 A nice thumbnail of good blue smithsonite from the Kelly Mine-- blue examples from this mine are considered among the most collectible. 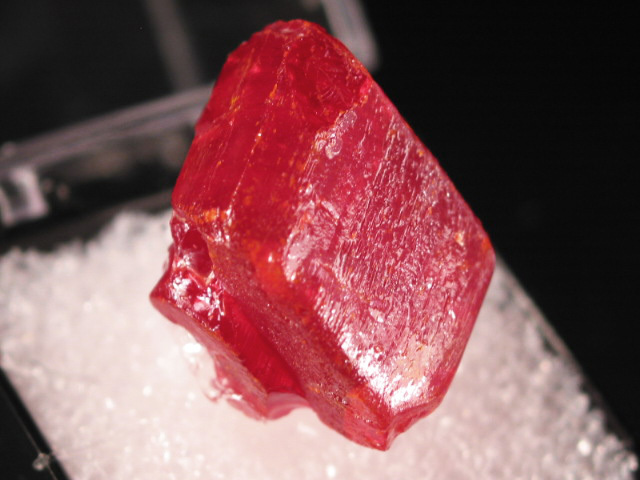 Contacted on the right. 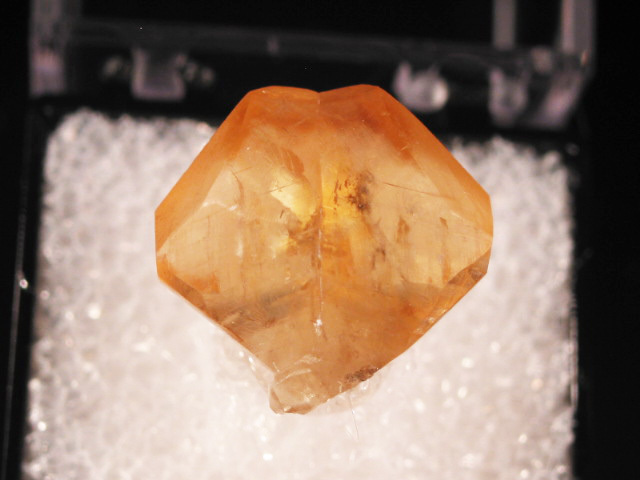 A nice pinwheel crystal of light yellow adamite from Mina Ojula. 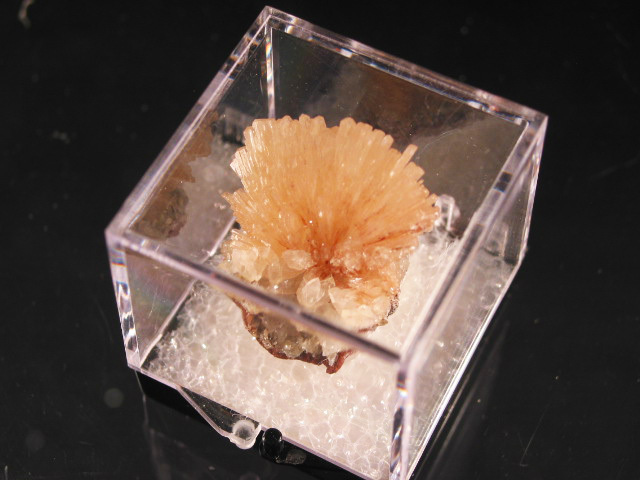 The color is a bit light, but the form is great. 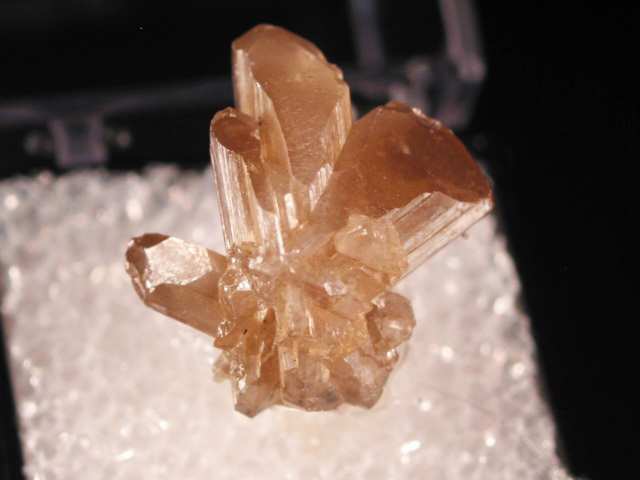 This was likely found in the 1970's, these days what tends to come out are smaller crystals scattered on limonite, or filling seams. 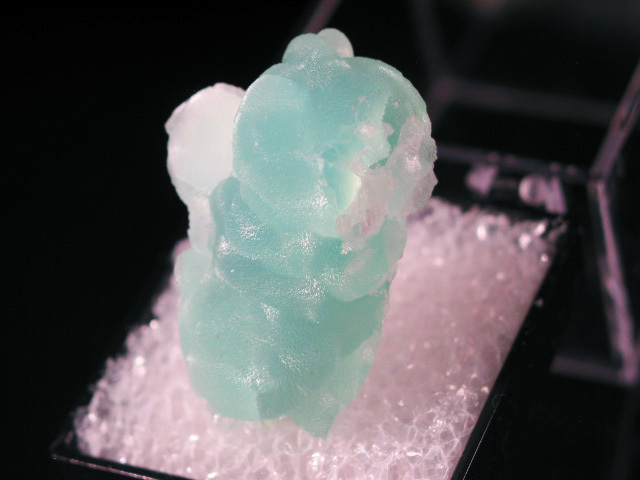 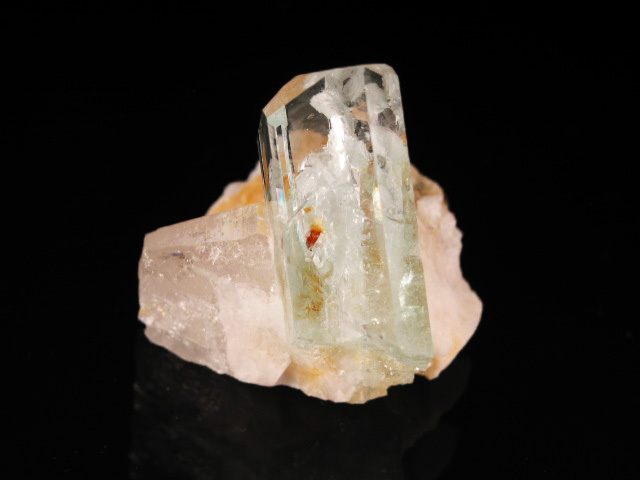 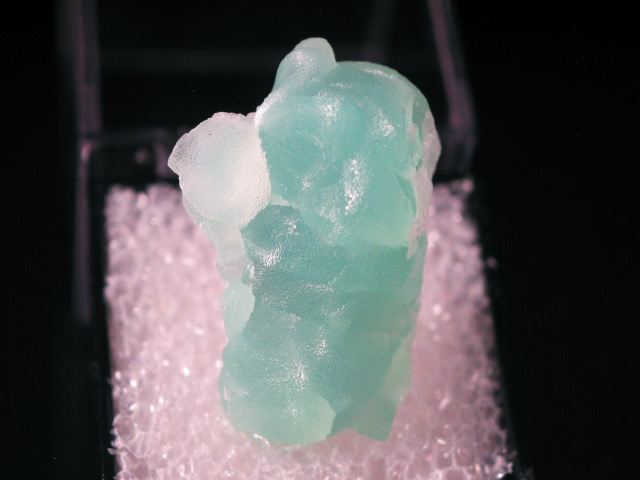 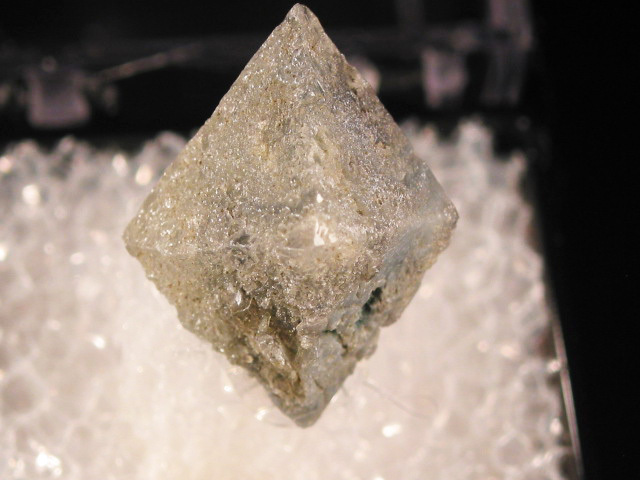 A terminated, very lightly colored aquamarine crystal on matrix, with an interesting dome-shaped termination and etched lateral faces. 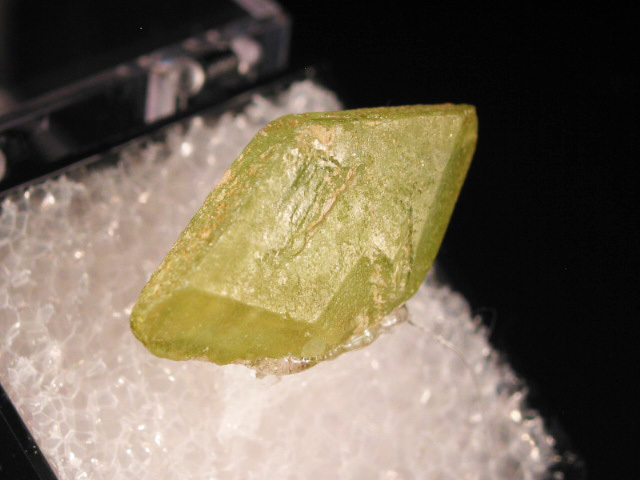 This comes from a pocket unearthed in 2006. 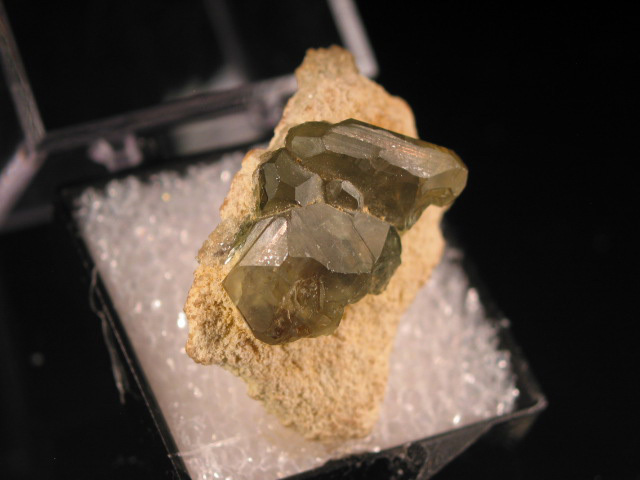 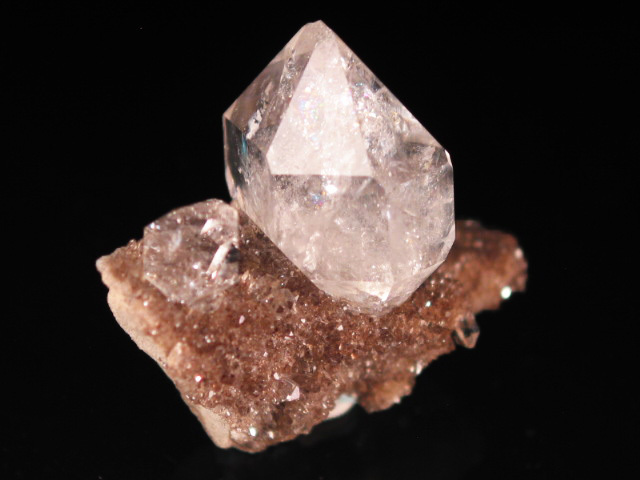 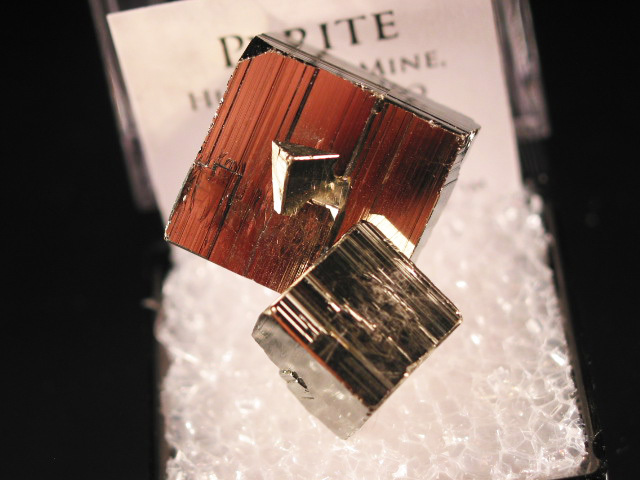 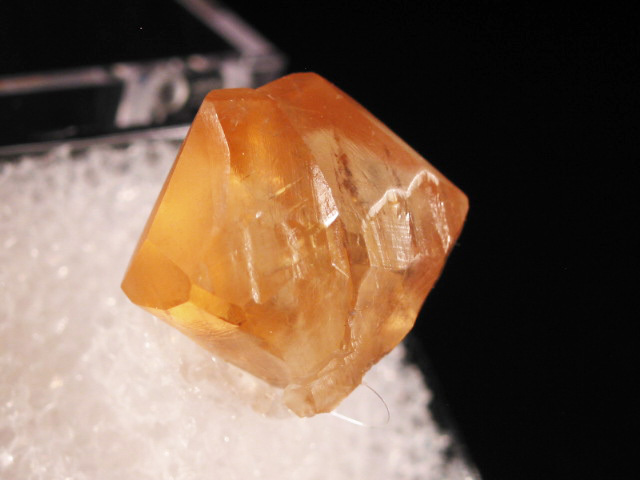 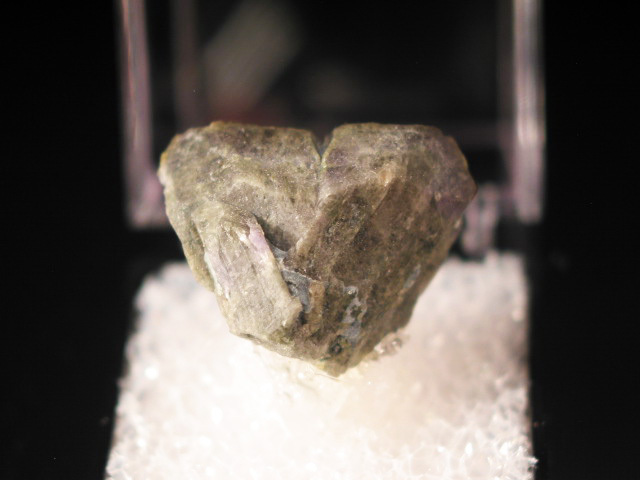 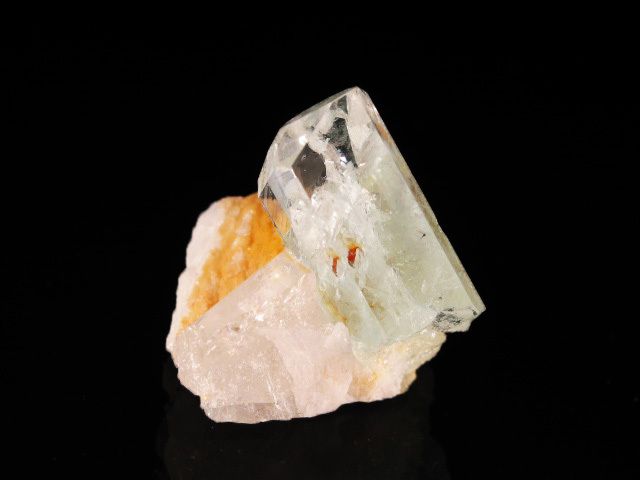 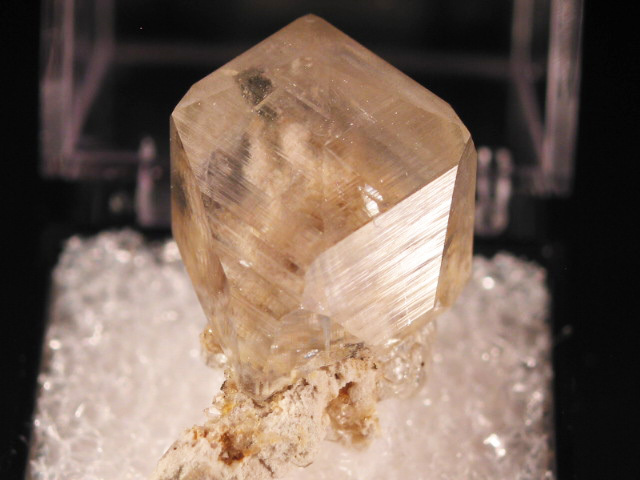 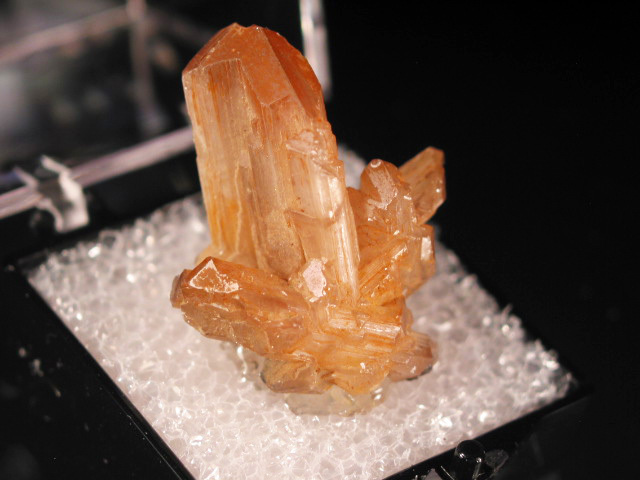 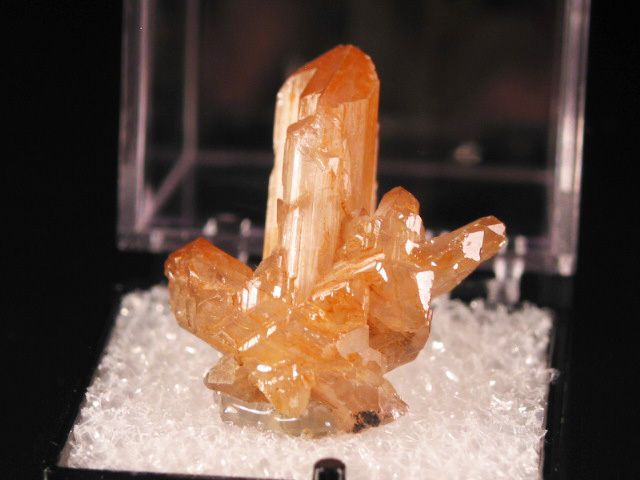 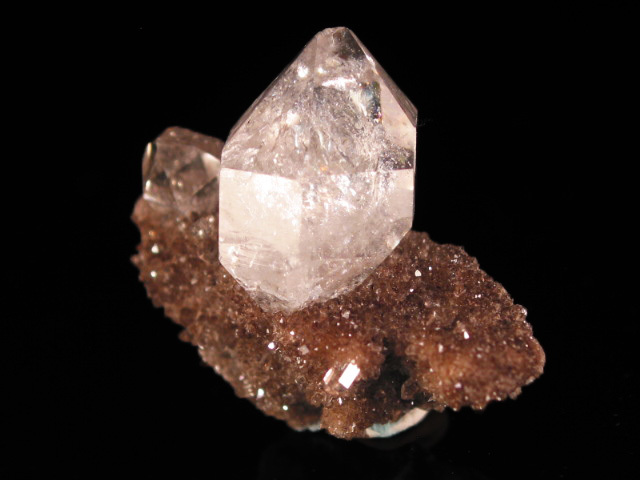 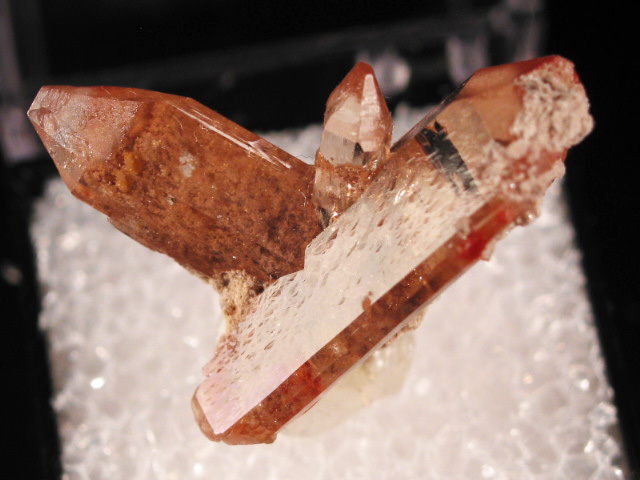 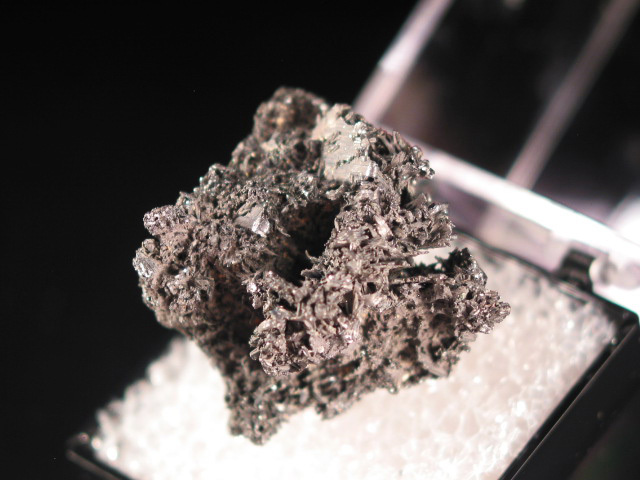 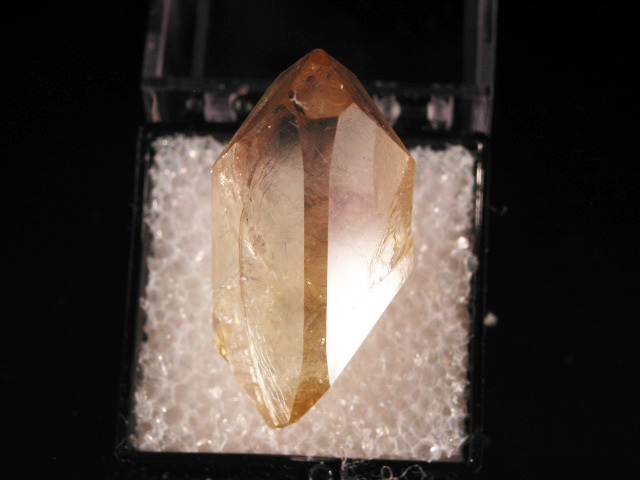 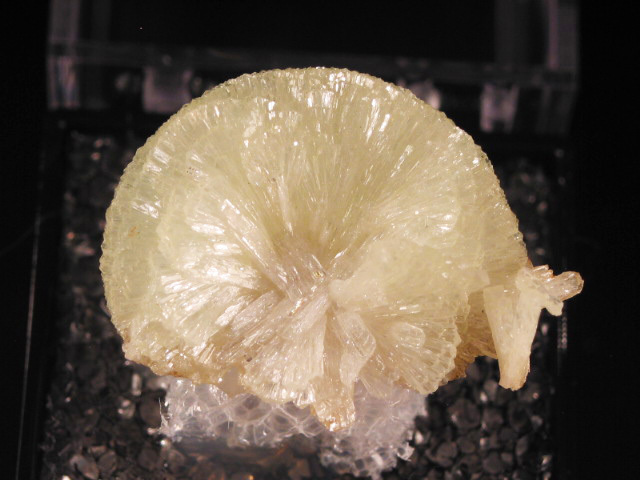 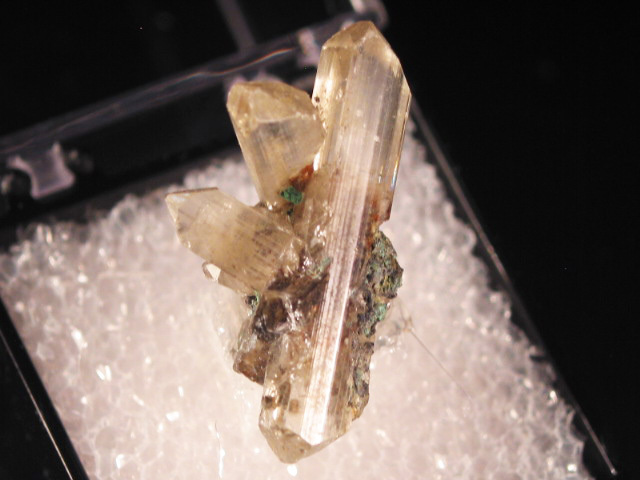 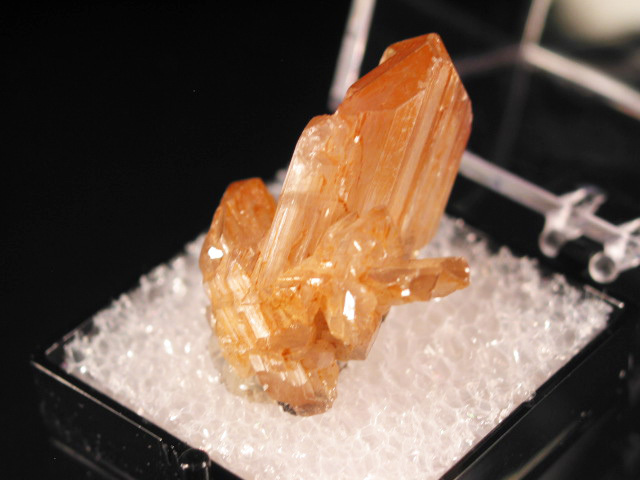 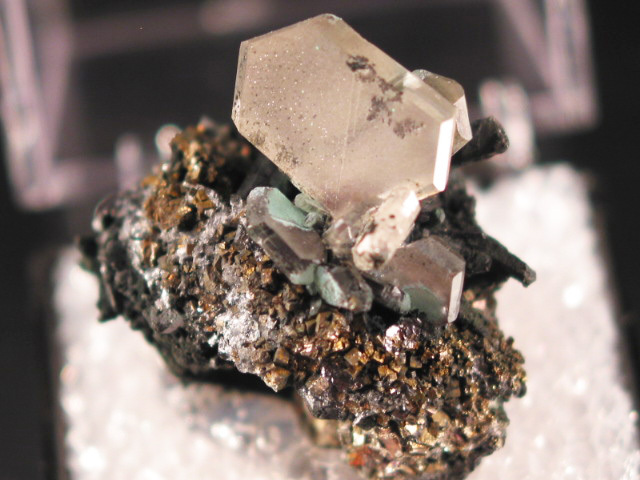 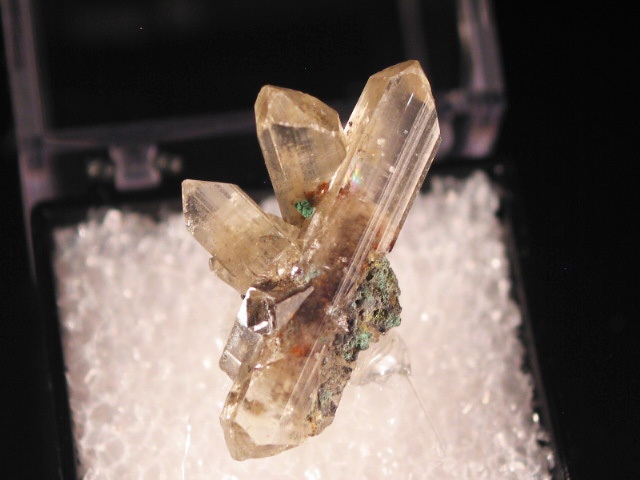 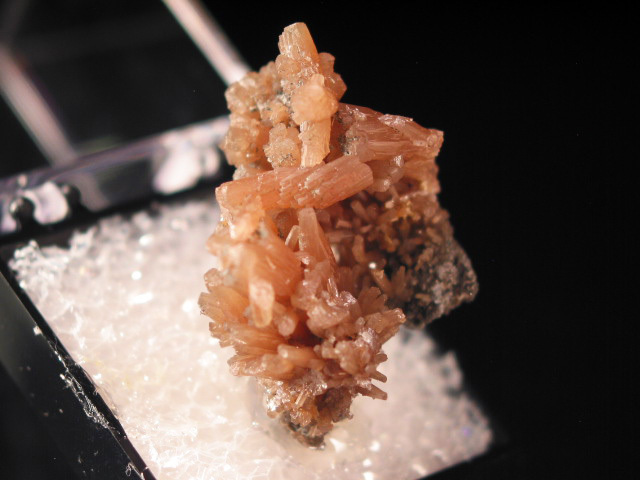 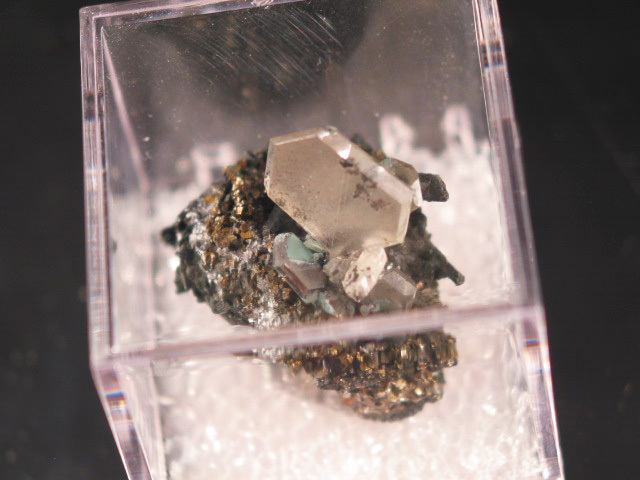 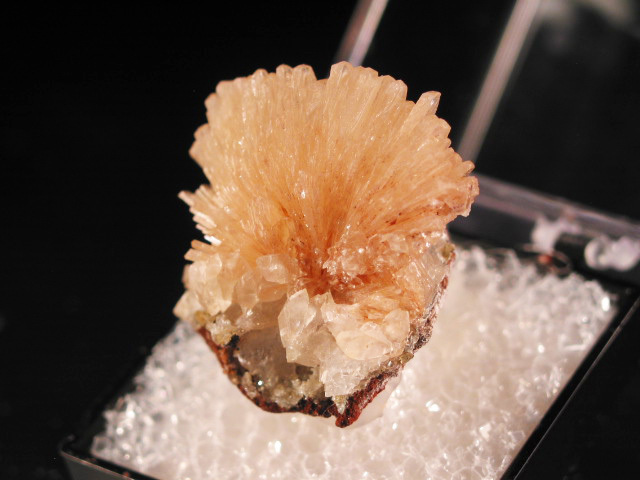 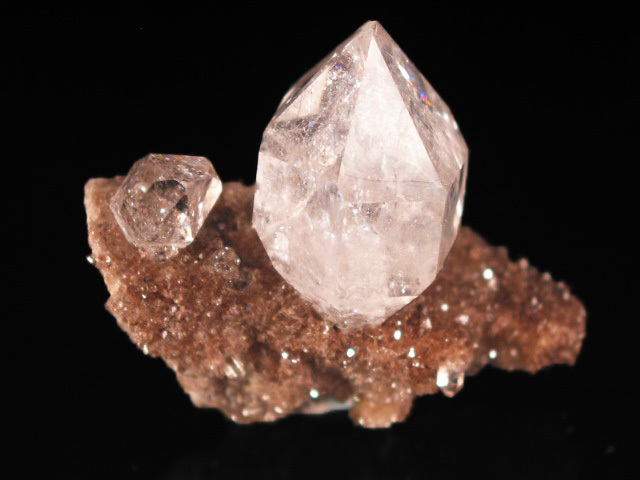 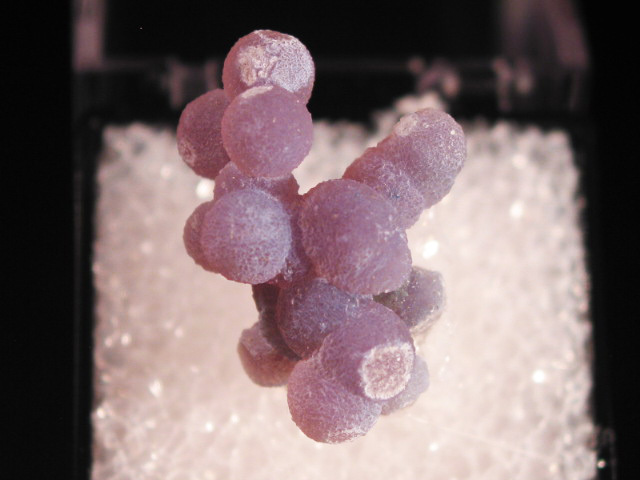 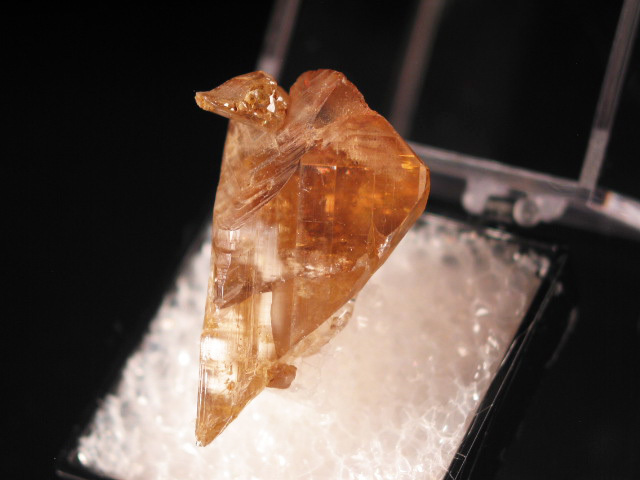 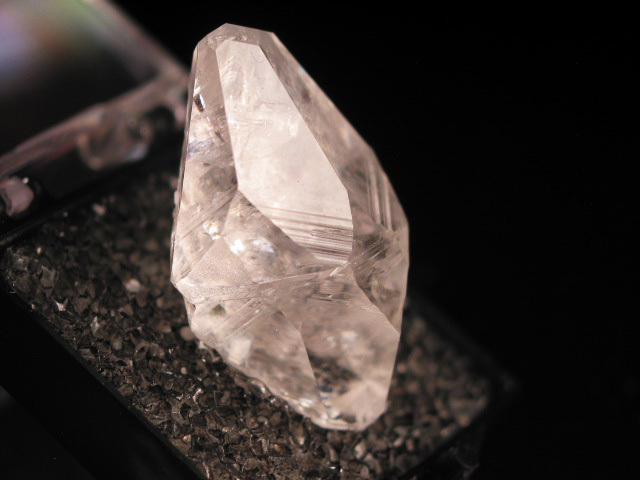 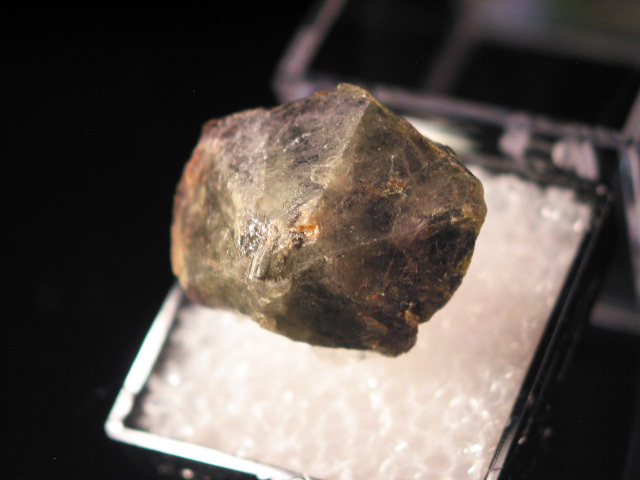 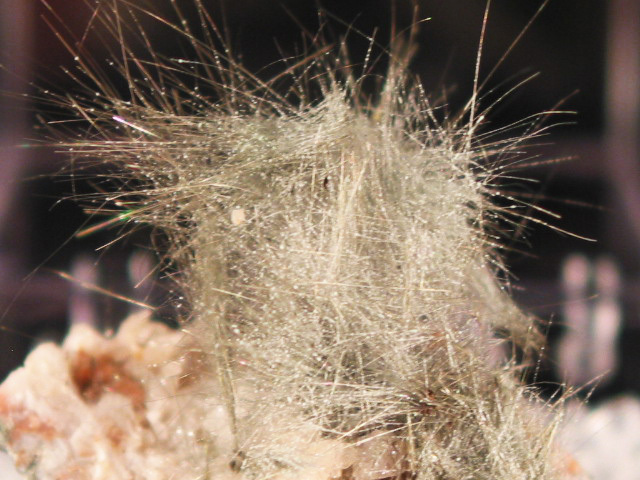 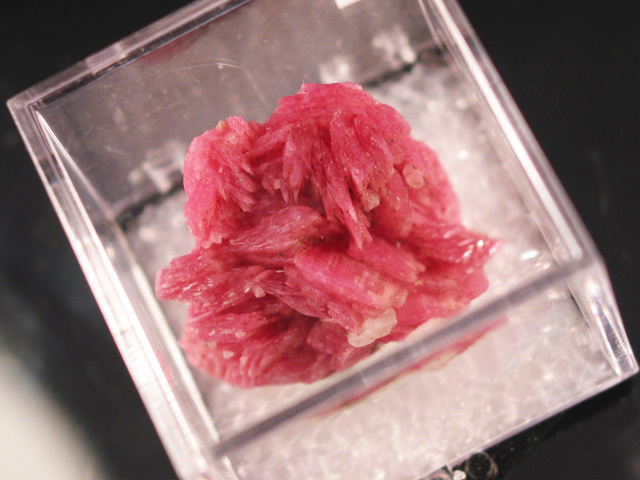 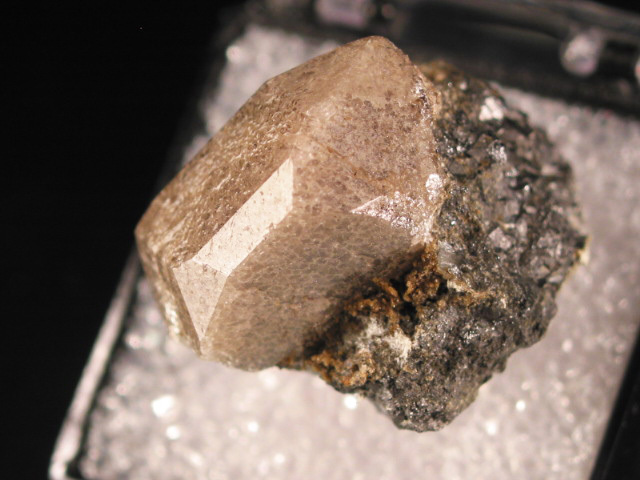 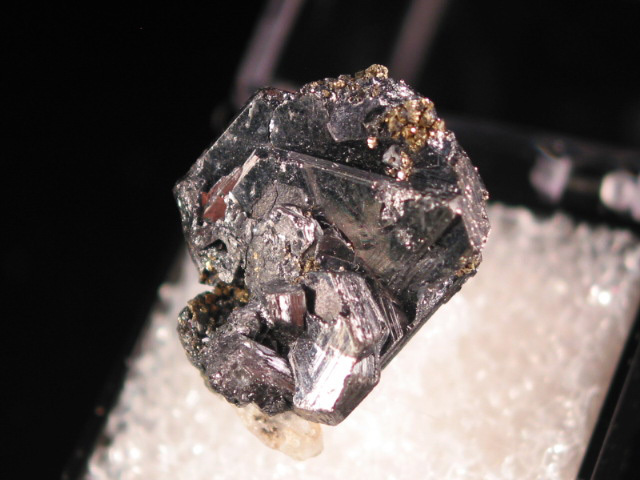 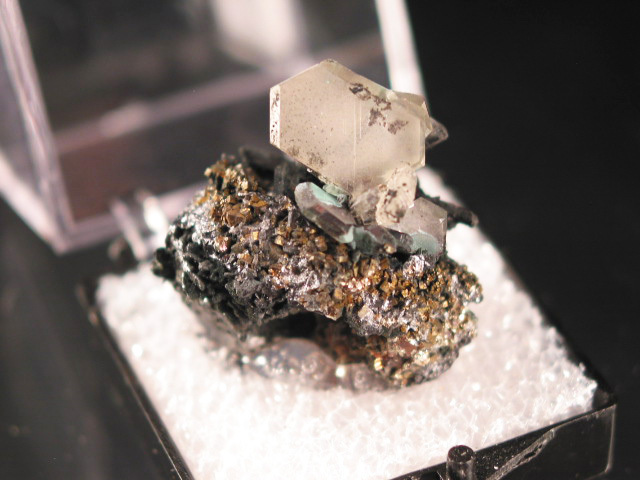 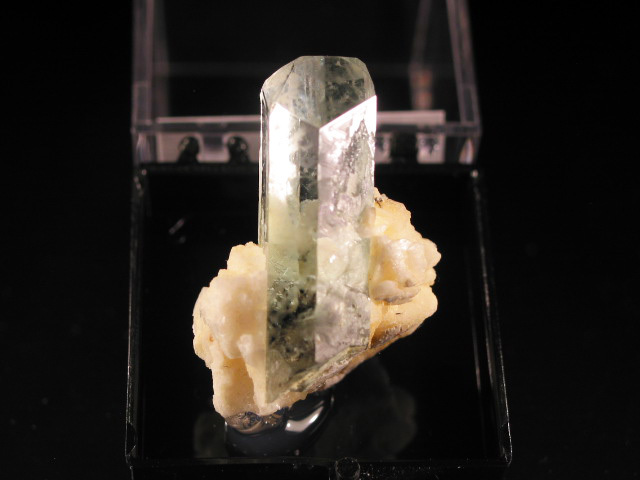 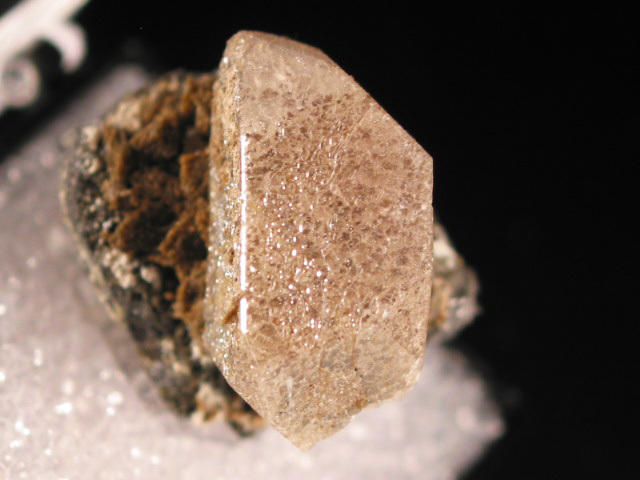 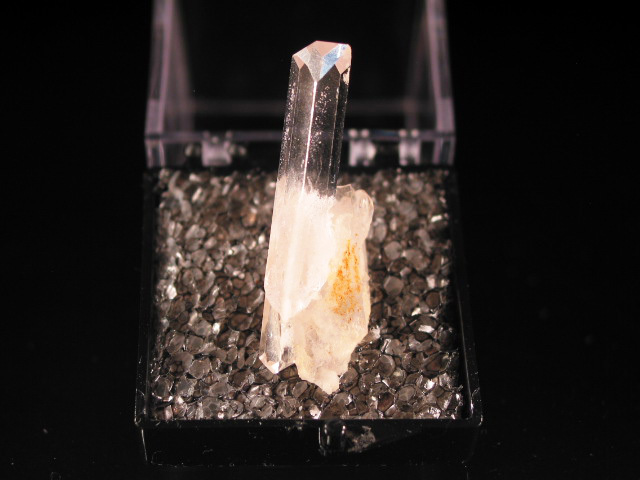 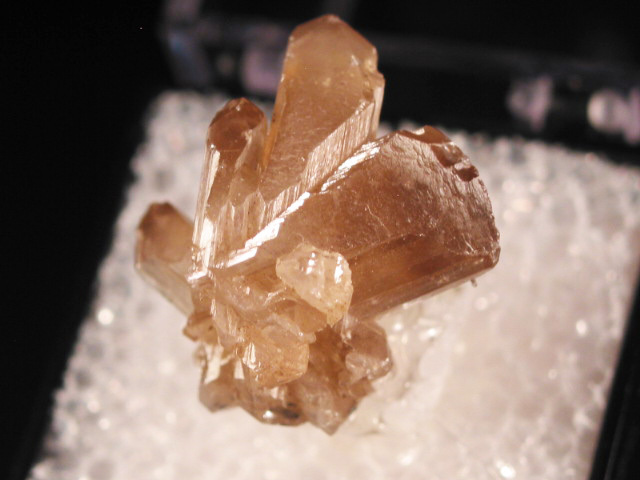 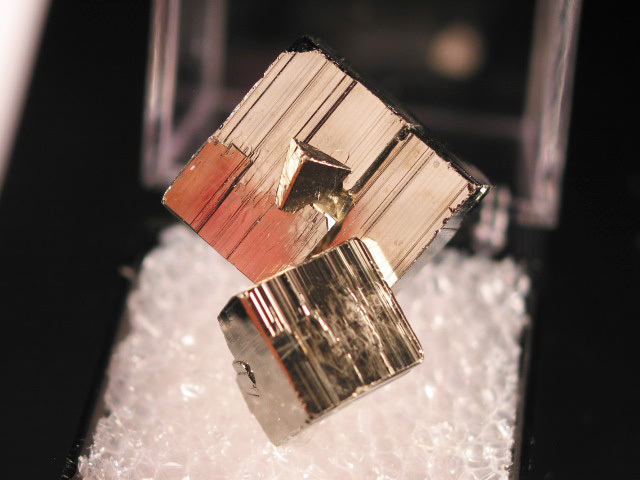 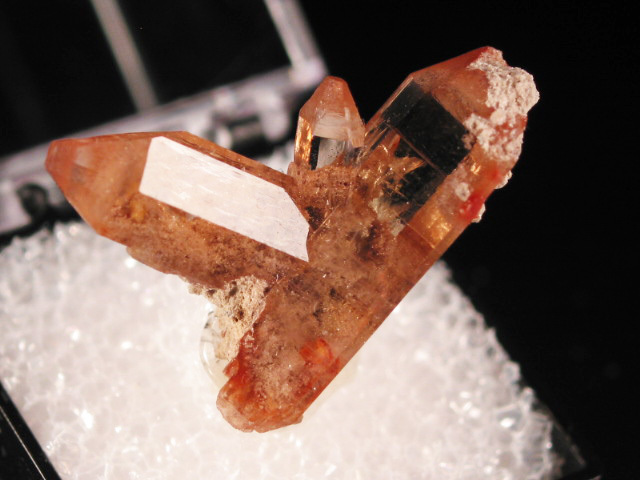 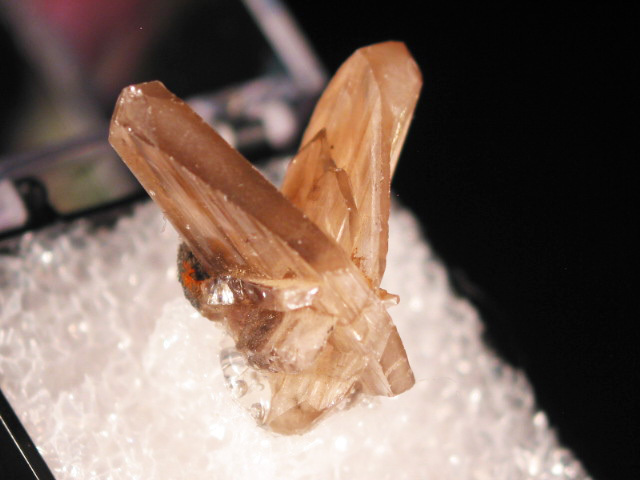 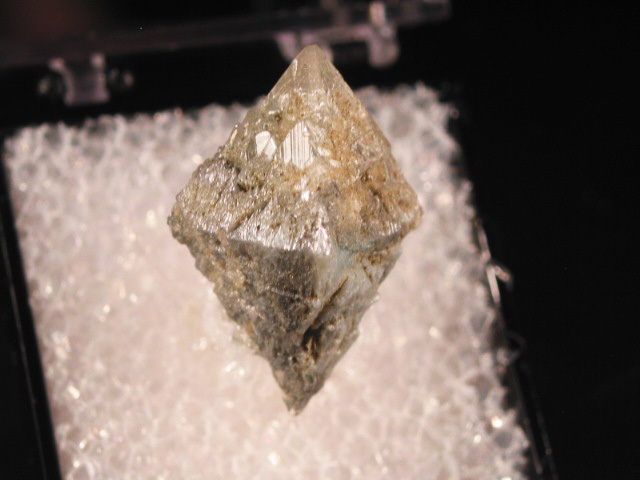 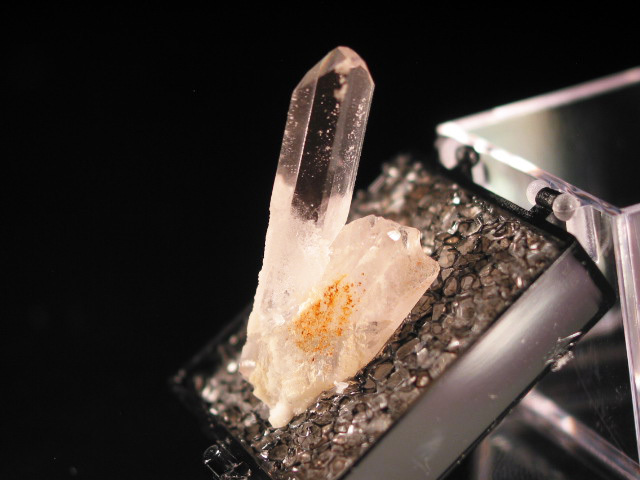 A choice thumbnail of cerussite from Mina Ojuela. 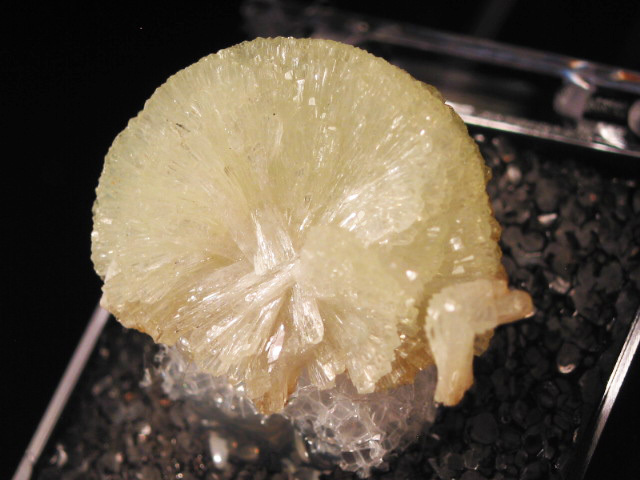 From any other location this would not be particularly special, but cerussite is notoriously difficult to find from this prolific location. 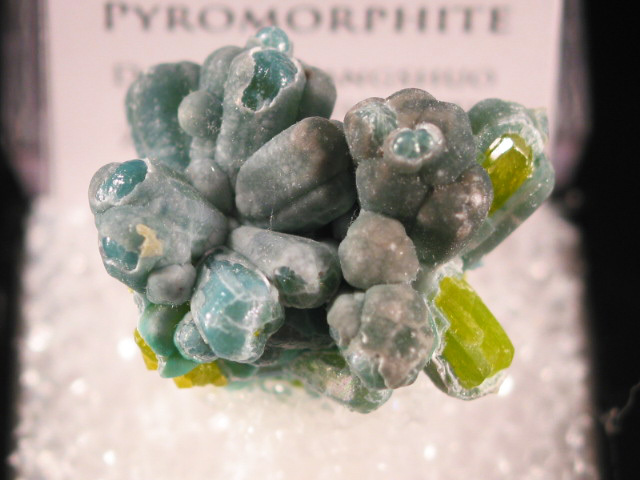 This piece comes from a small find made about 2 years ago-- most were large, chunky, and very ugly. 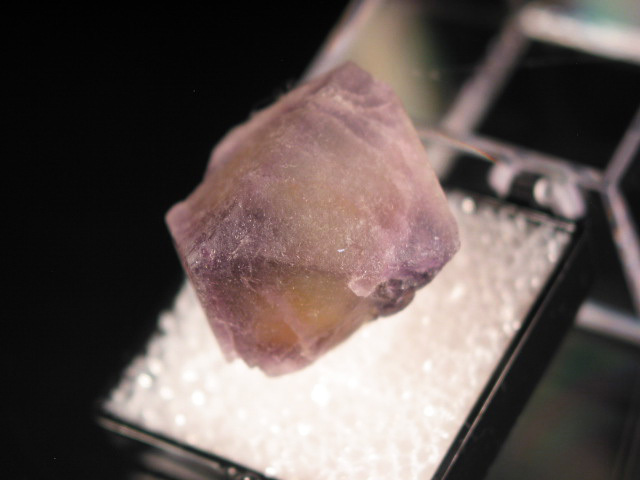 This was one of the few good thumbnail sized specimens I was able to salvage from larger masses of junk. 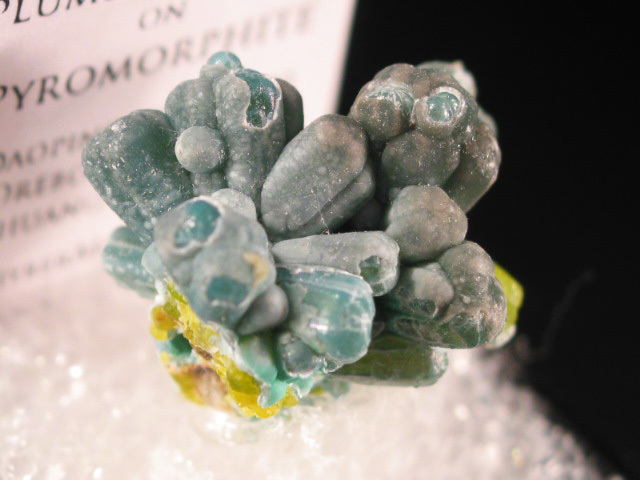 A beautiful example of blue hemimorphite from China. 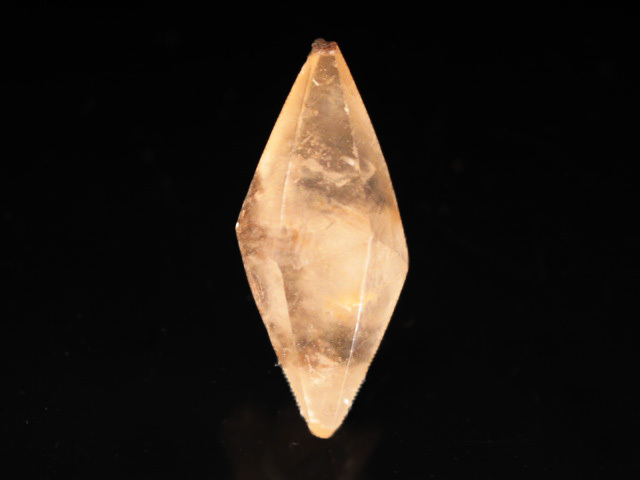 While these are not particularly hard to find, they are almost always larger-- good thumbnails are not often seen. 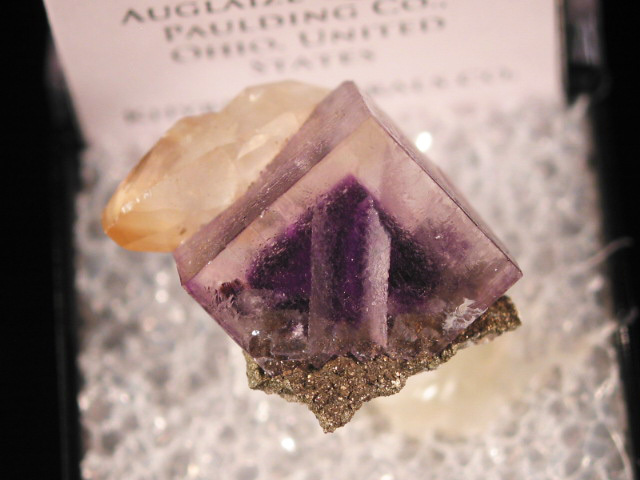 This one had a good combination of form, color, and luster so I have included it in this update. 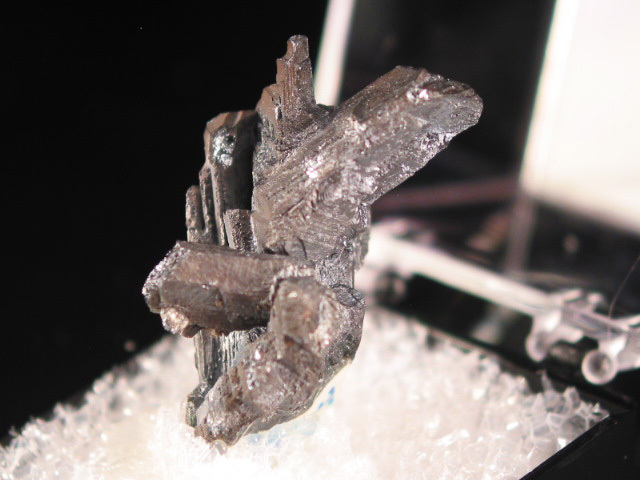 A nice thumbnail sized sample of lustrous, stacked hematite crystals from Italy. 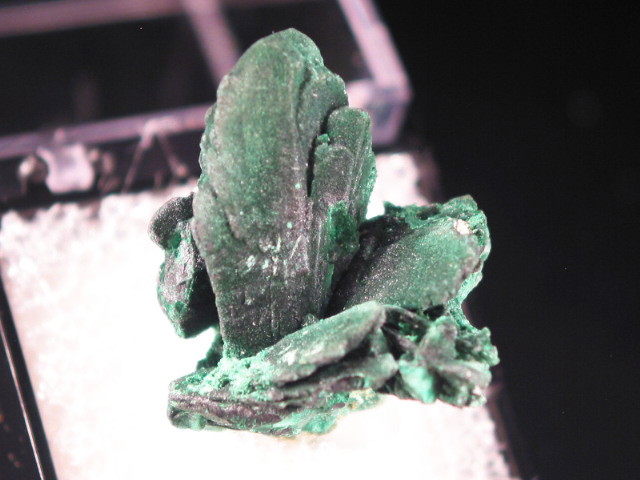 A nice (and older) thimbnail-sized of this lead sulfate, from Touissit. 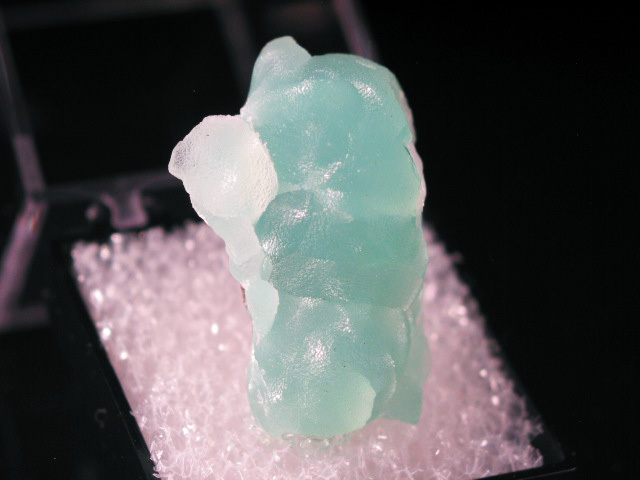 It is somewhat difficult to find good thumbnails of this material... most tend to be a bit larger in size. 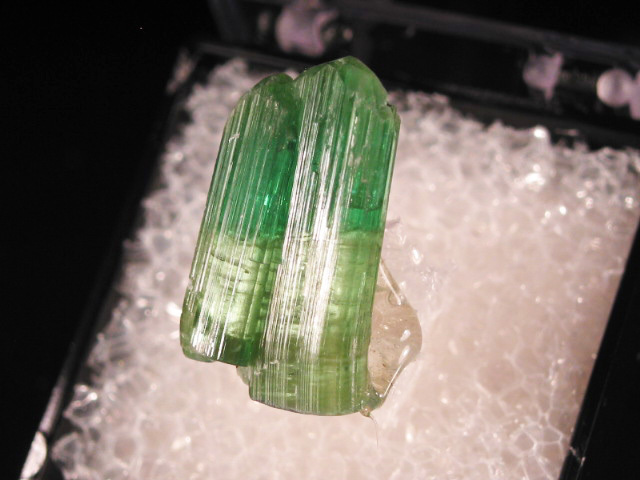 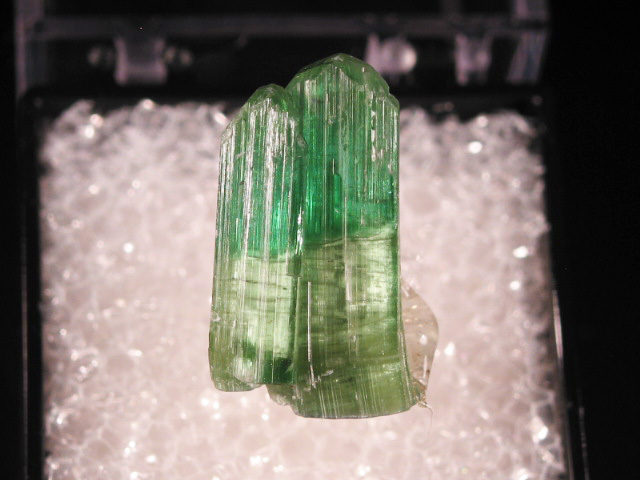 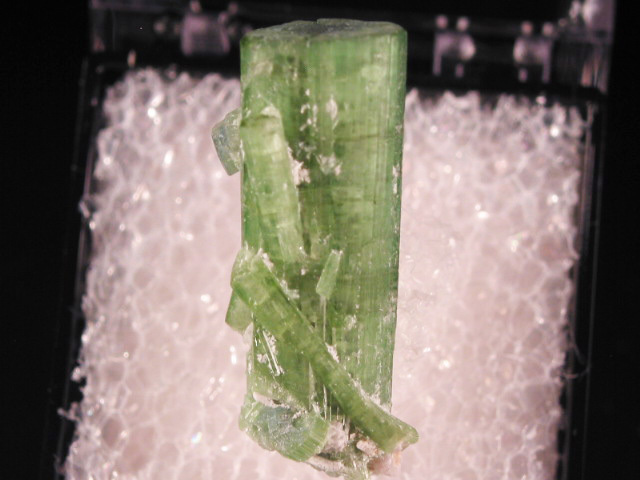 A nice thumbnail sized sampple of green tourmaline from Pakistan. 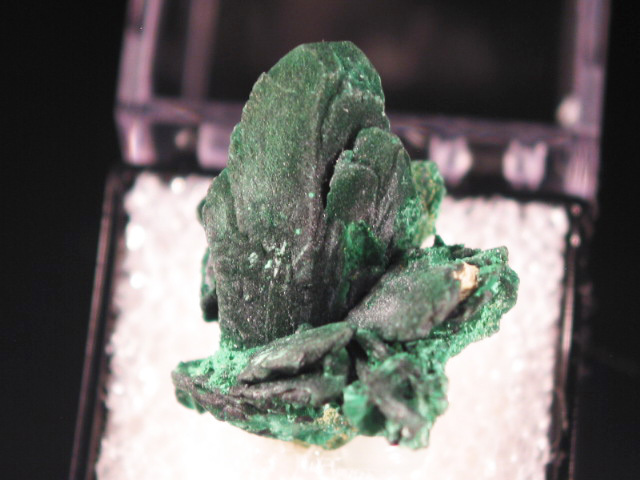 A nice thumbnail sized specimen of malachite after azurite from Milpillas. 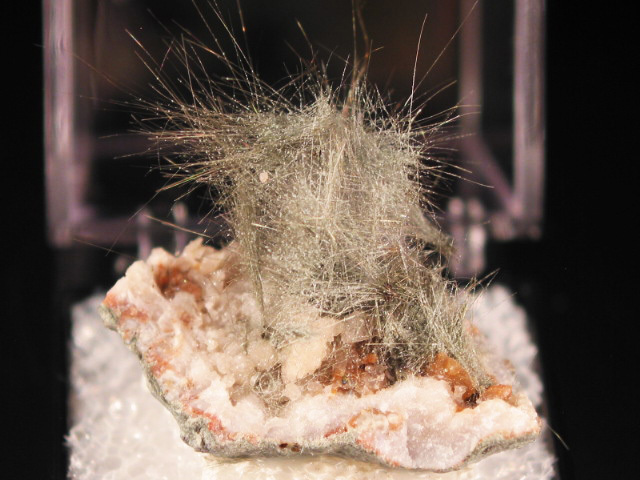 The arrangement on this one is pretty good for the location-- for whatever reason these psudomorphs tend to end up looking somewhat jumbled and messy... the main crystal on this one however is nicely distinct. 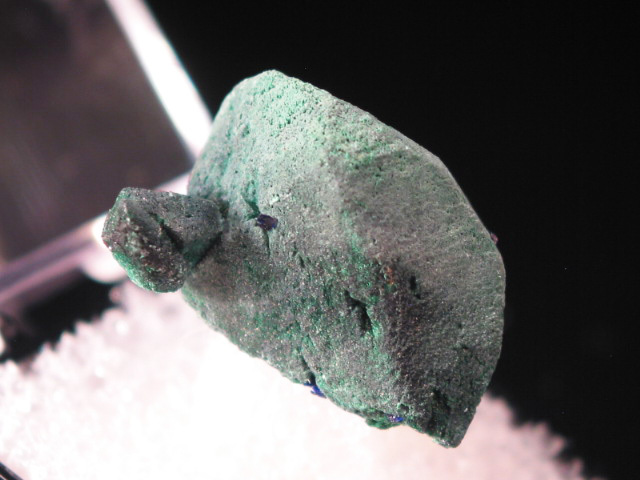 A nice thumbnail of azurite after malachite from Arizona. 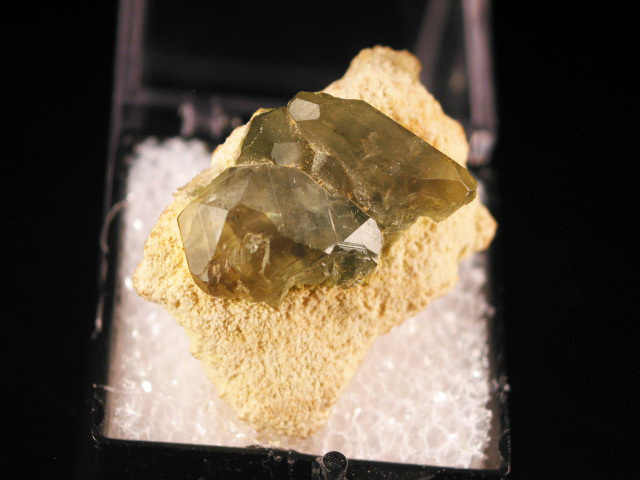 A decent reference thumbnail of chrysoberyl from Zimbabwe. 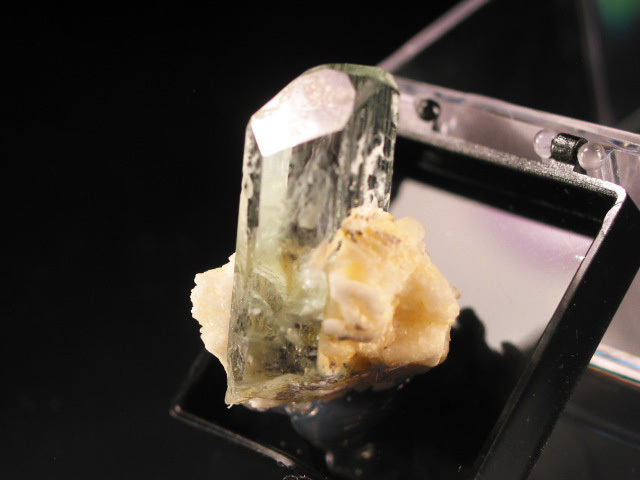 I'm not selling this as an alexandrite, but there is definitely some color shift from a dull green to a brighter one when the specimen is observed in incandescent vs. daylight equivalent light. 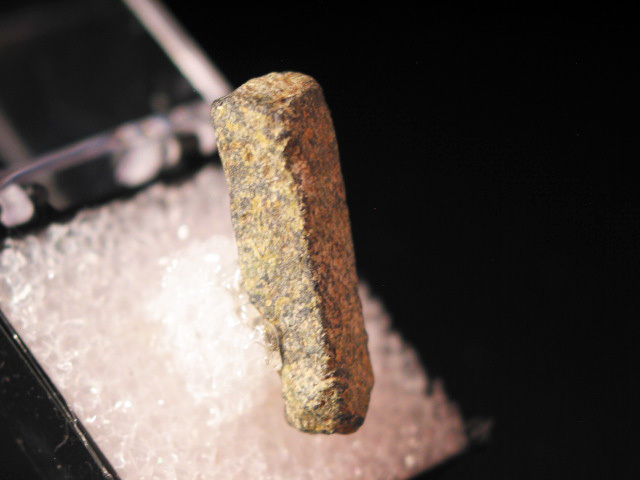 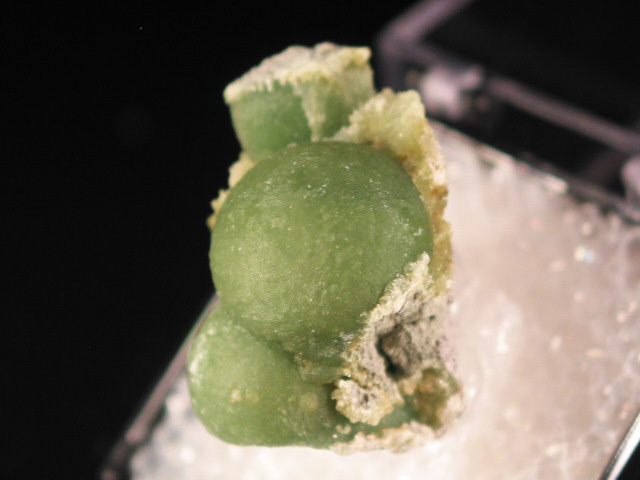 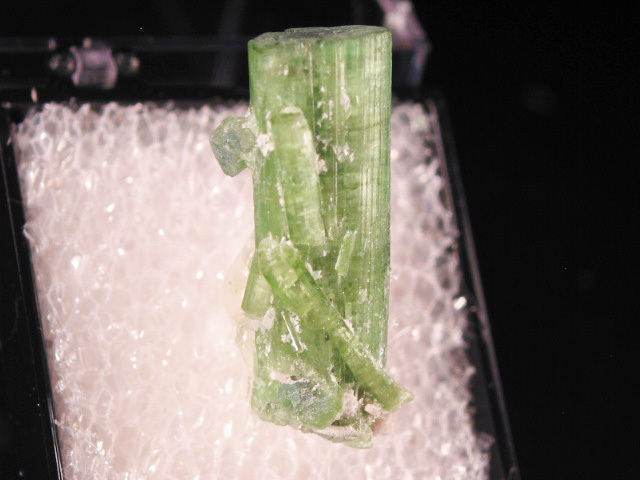 A nice thumbnail-sized example of pyromorphite from a classic German locality. 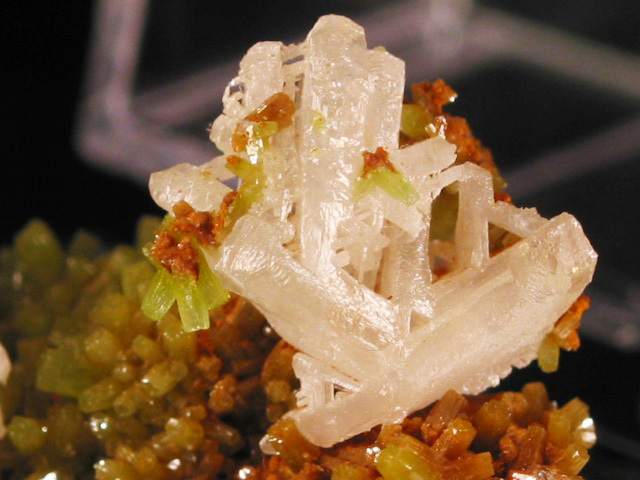 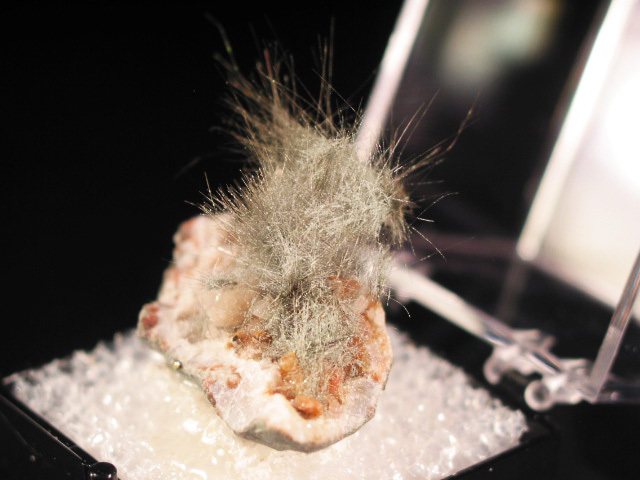 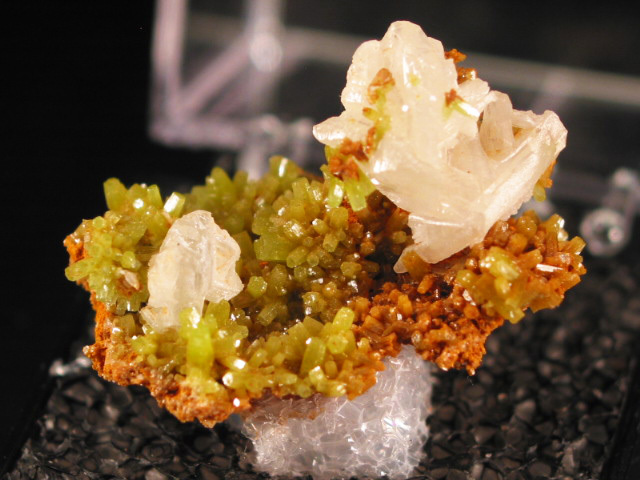 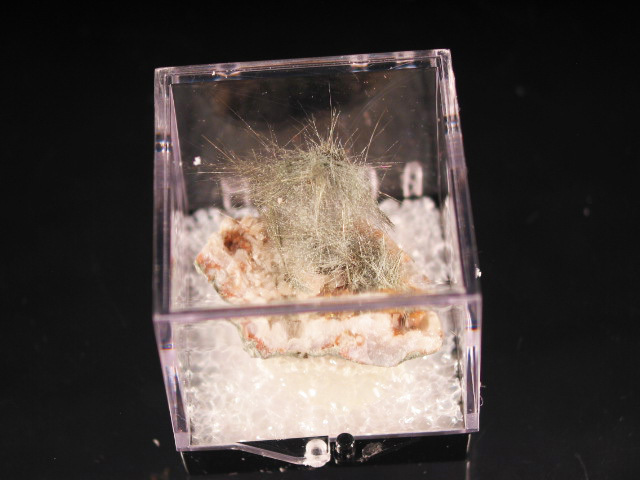 It's hard to imagine the mineral market without Chinese pyromorphite, but before 1999 your main options for a good example would have been a piece from Les Farges, Cordoba, Bunker Hill, or one of these German pieces. 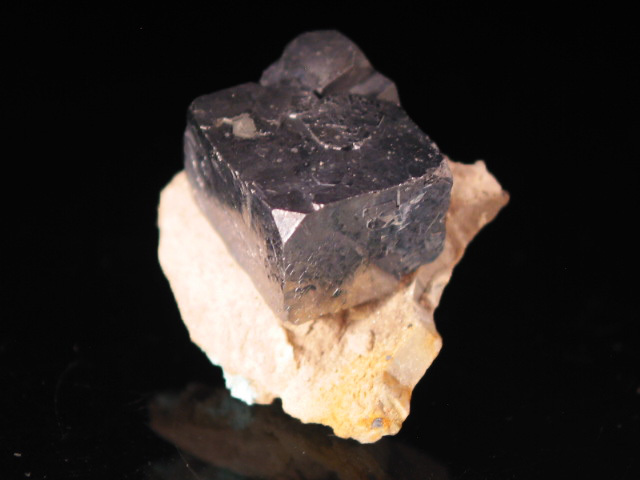 Tri-State galenas are my favorites-- the contemporary Viburnum Trend (on the opposite, eastern side of Missouri) always seem messier, with their compound faces and breccia matrixes. 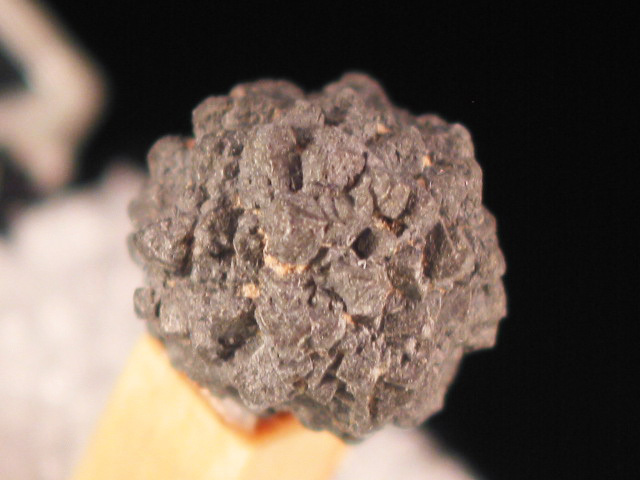 A nice spherical cluster of arsenic CRYSTALS from the only locality I know of where this element has been collected as samples with visible crystals-- it's always massive or botryoidal from everywhere else. 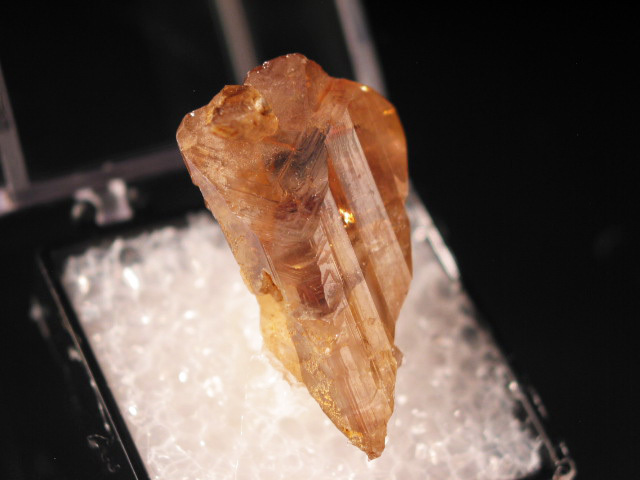 A nice reference thumbnail of water clear, unusually elongated calcite from this little-known Copper Country locality. 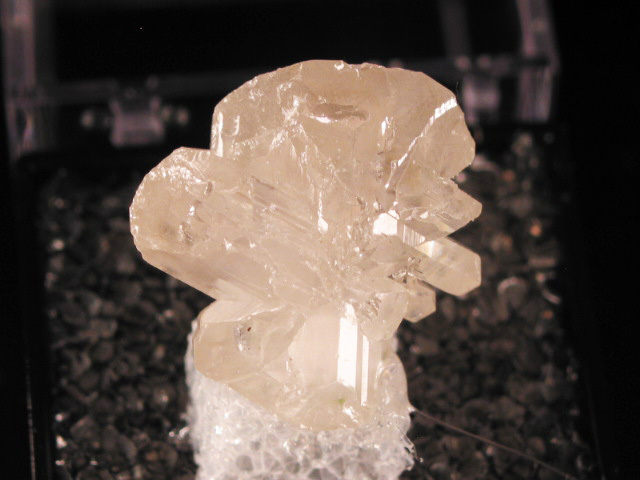 These tend to look more like quartz than calcite. 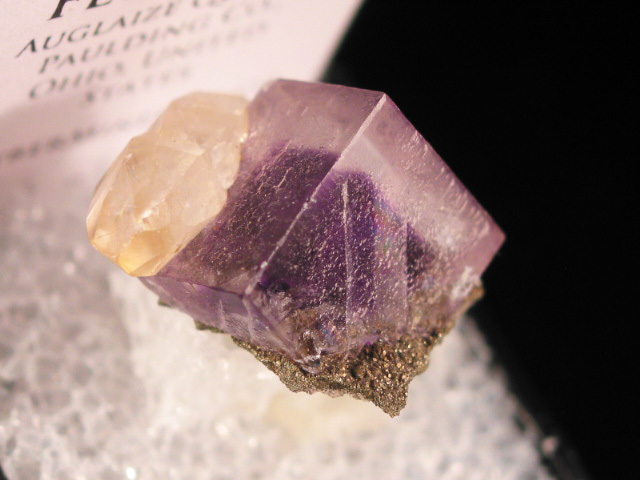 Corocoro District, Pacajes Province, La Paz Department, Bolivia. 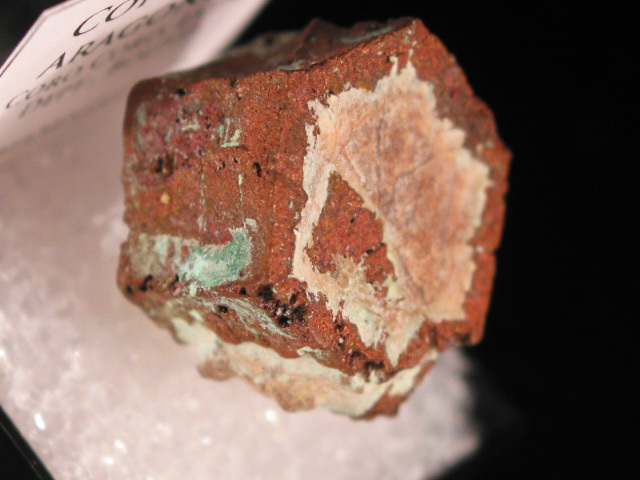 A very sharp and well formed thumbnail of copper after aragonite from Bolivia. 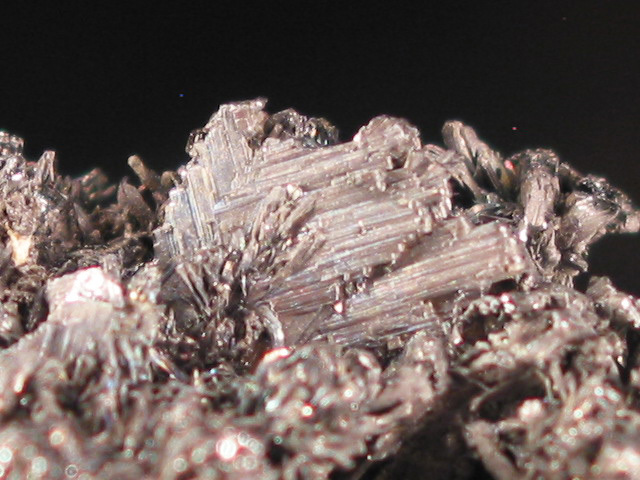 This was selected from a lot of a couple hundred.... the size, sharpness and clear form make it an excellent thumbnail of this material. 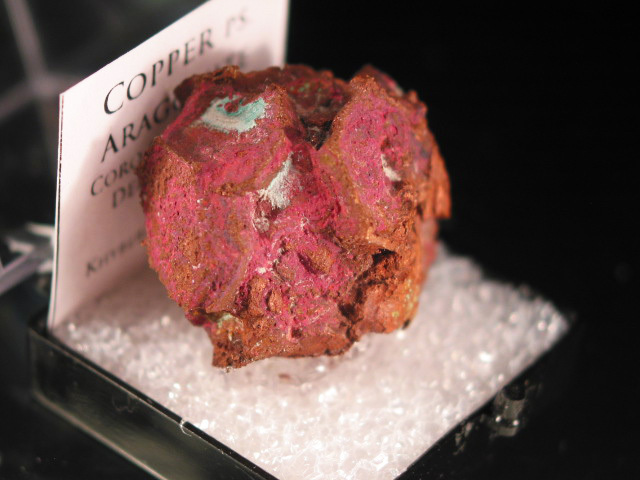 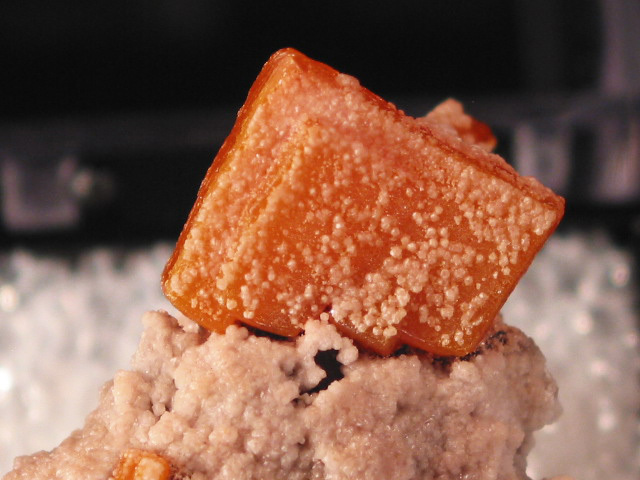 At Corocoro, these copper after aragonite pseudomorphs are primarily found in two forms: single hexagonal crystals, and spherical aggregates of them. 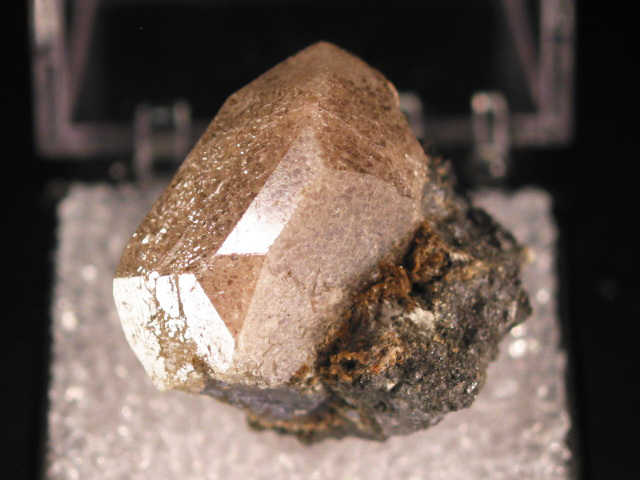 This is a very nice example of a the latter, reasonably well shaped with the individual hexagonal crystals somewhat visible. 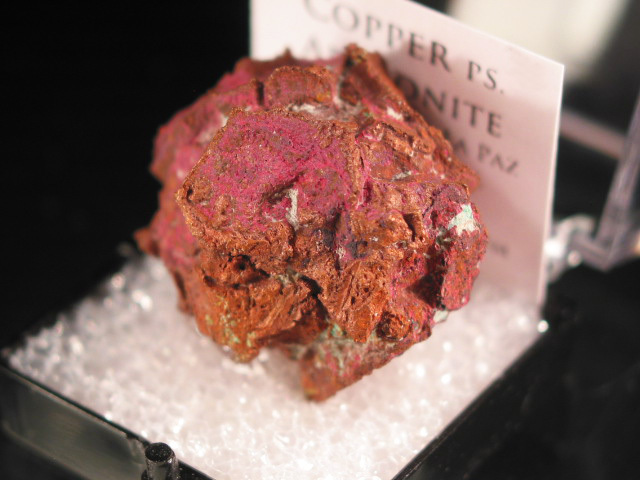 There is even a bit of redish patina, likely a micro dusting of cuprite. 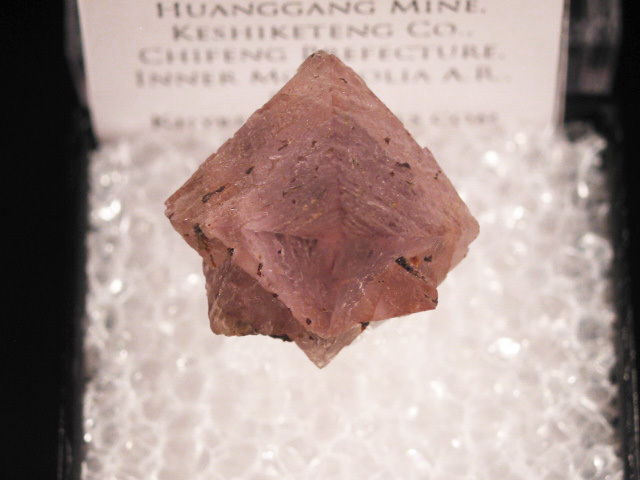 A nice little sample of this highly sought after, and very scarce combination from the Daoping Mine. 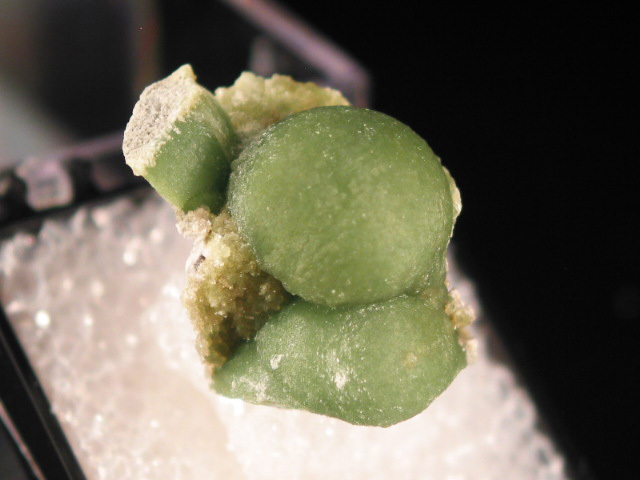 We've all seen a billion Daoping pyromorphites, and a handful of cerussites from there... but both together has always been an elusive combination. 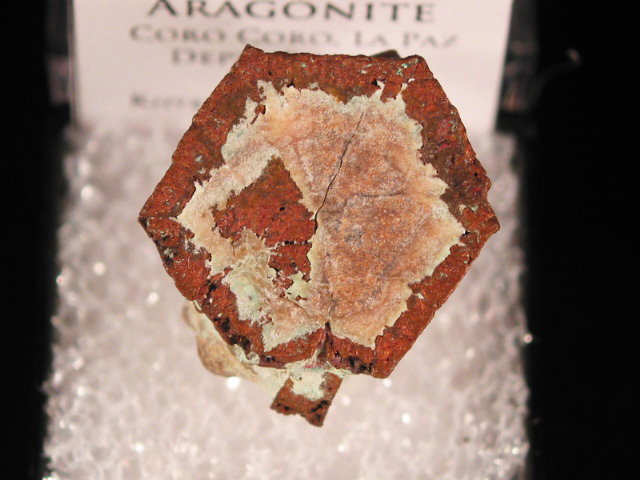 This one has a bit of yellowing (iron oxide, maybe?) 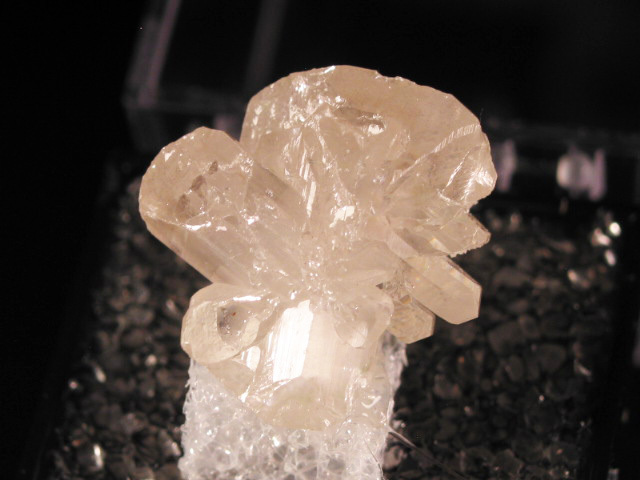 but is still a good example of this material, hosting a nice "snowflake" of reticulated cerussite. 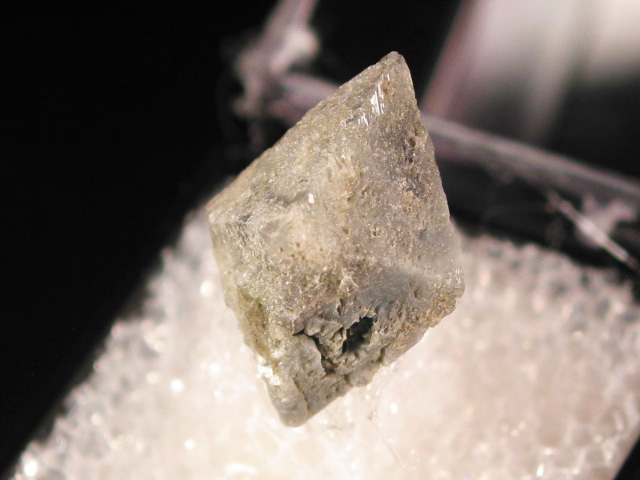 A singly terminated thumbnail of scheelite from Huanggang. 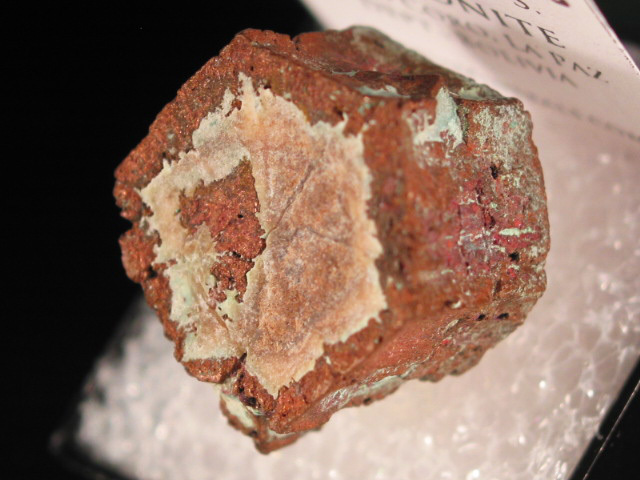 It's hard to find thumbnail sized examples of this material (especially on matrix.) 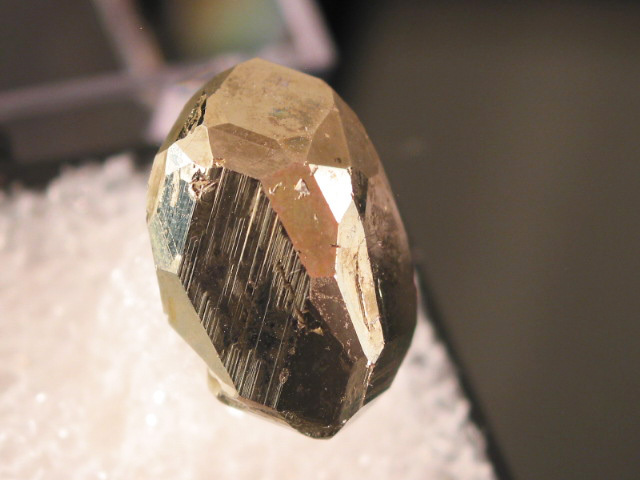 This one has exceptionally good luster and sharpness-- they tend to have suffered various degrees of etching. 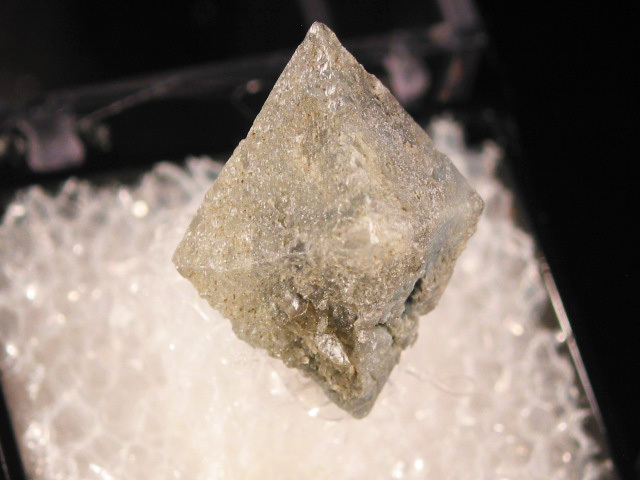 A nice doubly terminated calcite scalenohedron from Ohio. 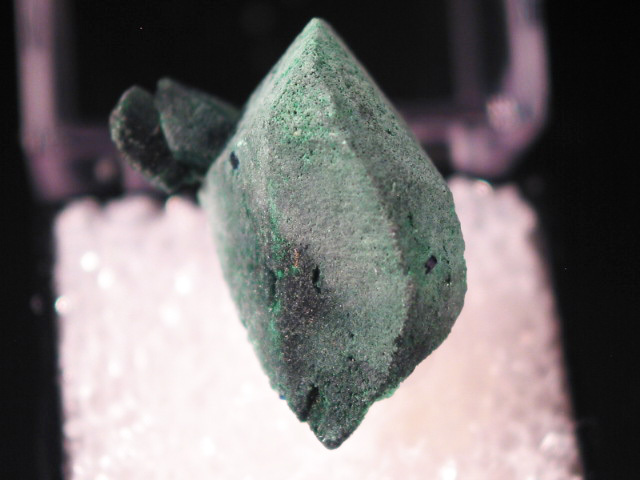 Great form, and a nice thumbnail example of material that is usually somewhat large and clunky. 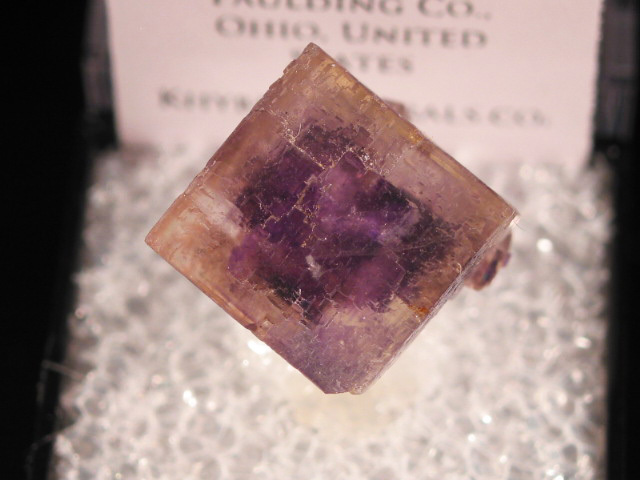 A nice sample of fluorite with a purple phantom, from the Auglaize Quarry in Ohio. 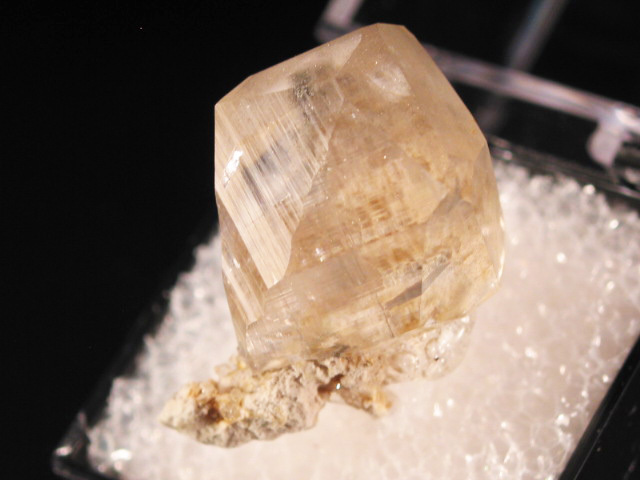 Older material. 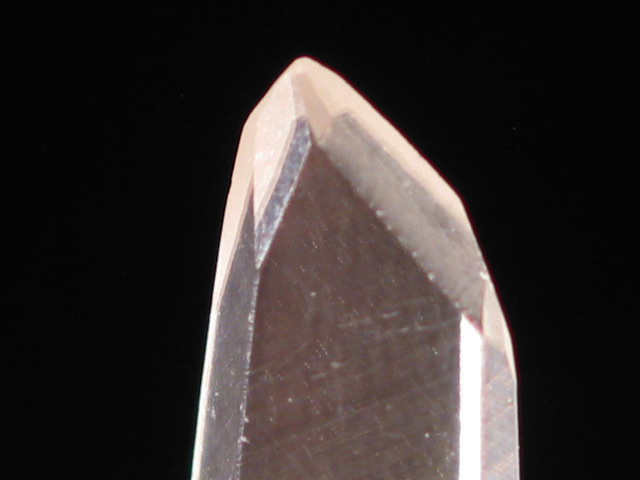 The 1.9 cm dimension is the diagonal. 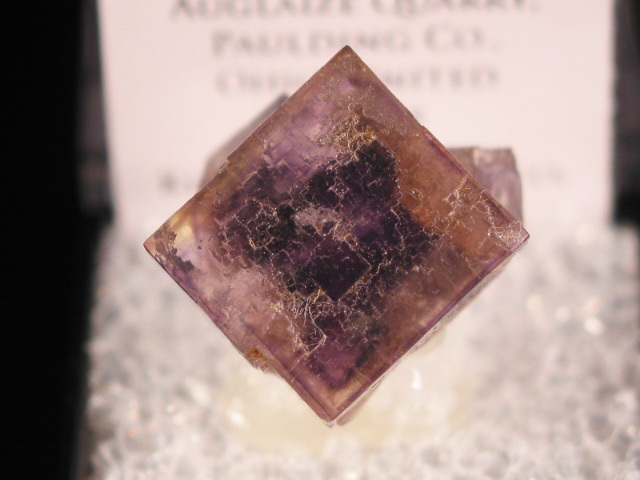 A very good thumbnail of fluorite from the Auglaize quarry, with a very clear phantom. 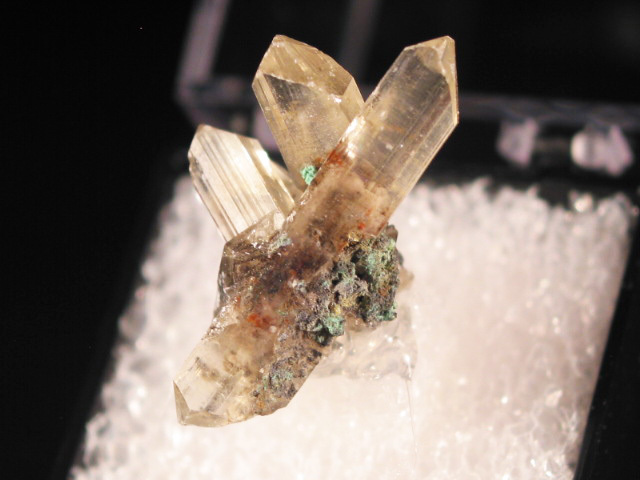 Older material. 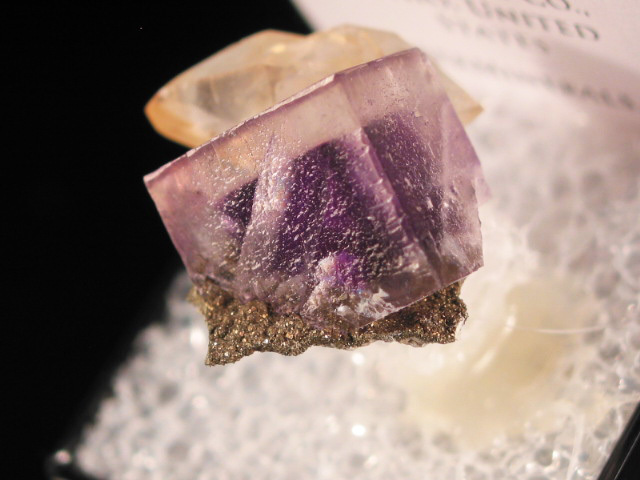 A nice thumbnail of fluorite with a clear purple phantom, with a little calcite perched on its edge. 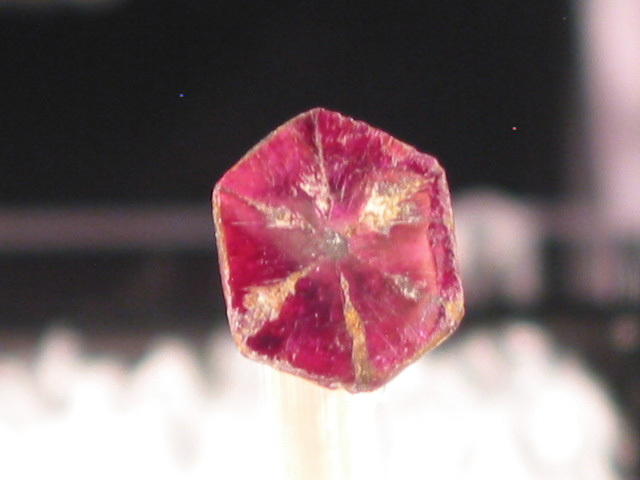 Older material. 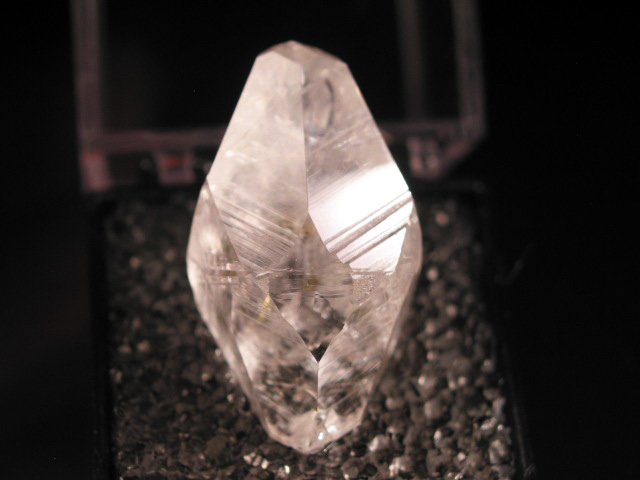 The 2.2 cm dimension is the diagonal. 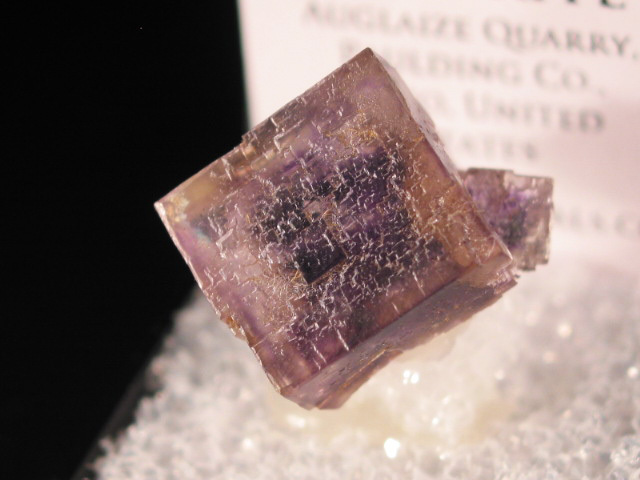 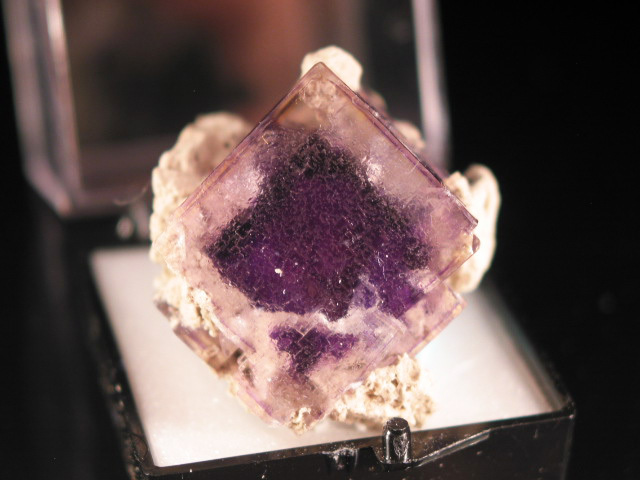 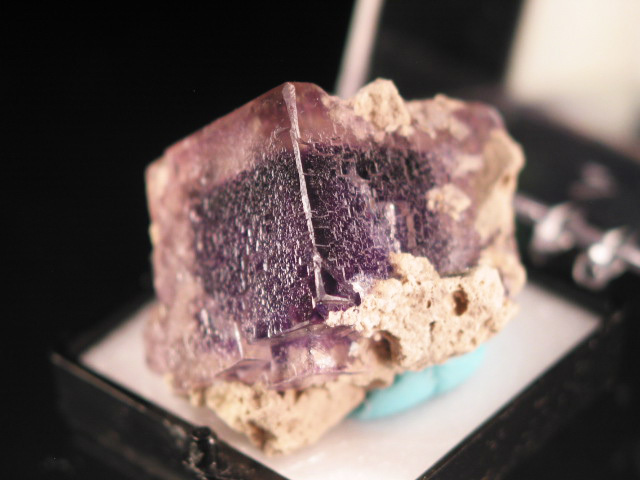 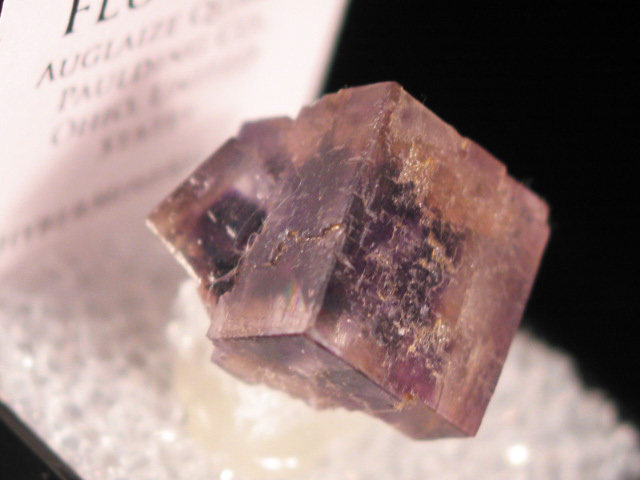 A nice thumbnail of fluorite from the Auglaize quarry, with a purple phantom. 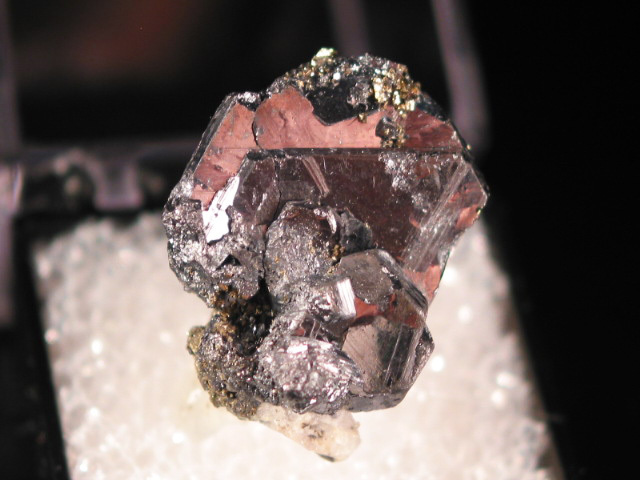 Older material. 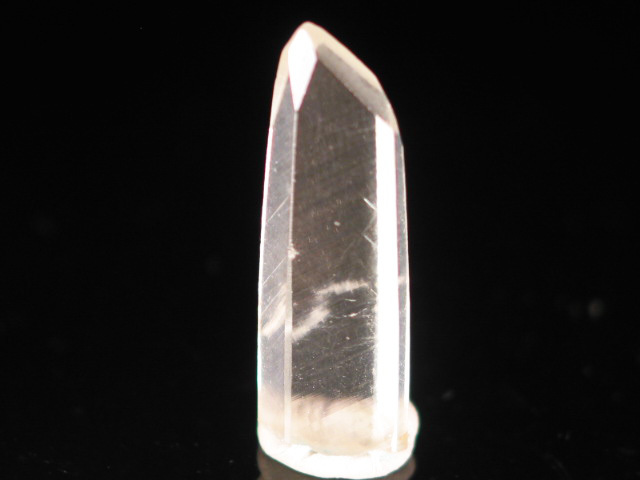 The 2.0 cm dimension is the diagonal. 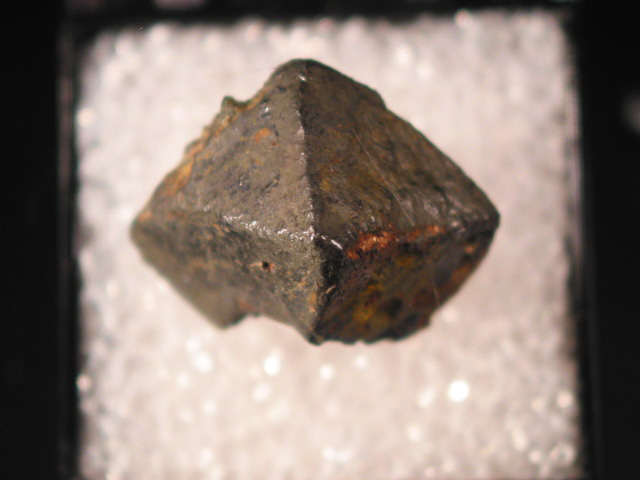 An interesting pyrite from Milpillas-- for what I've seen, they tend to either form gigantic cubes that get broken during extraction, or these very cool polyhedrons that appear rounded because they have so many faces. 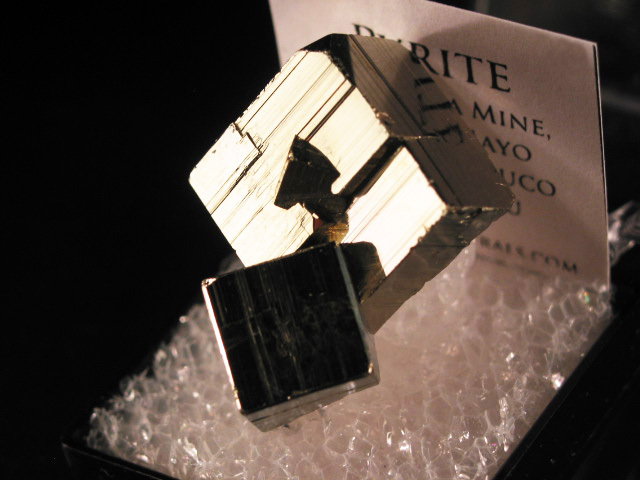 It's an interesting pyrite habit that I haven't seen from other locations. 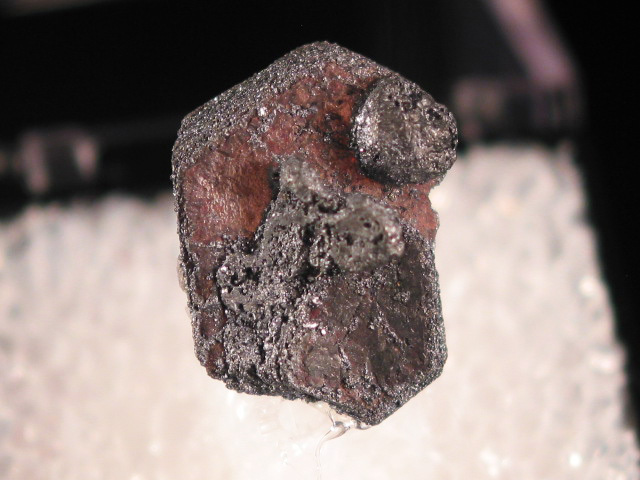 A decently sized partial octahedral crystal uraninite. 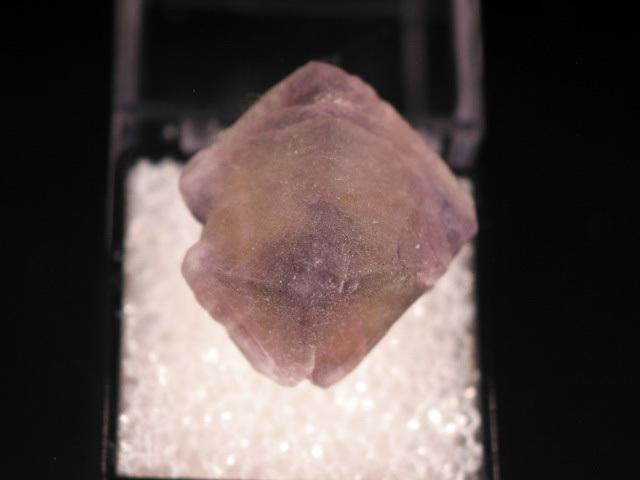 You can celarly see the octahedral shape from one side (facing upwards, as mounted) though its a bit less clear from the others... the pictures should give a good idea. 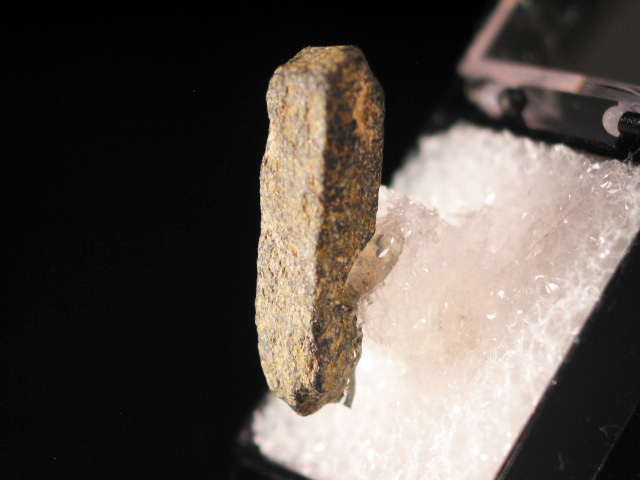 Either way, it is a rather sizable *crystalline* example of this material from a less frequently seen locality-- I think nearly all of the uranininte crystals that make it to the market come from Maine, and are usually smaller. 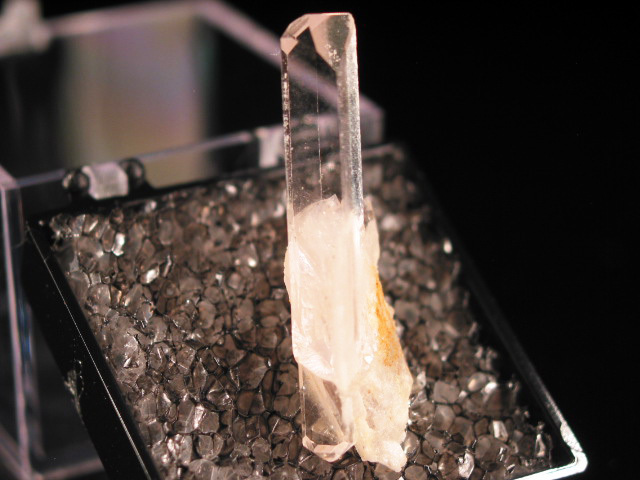 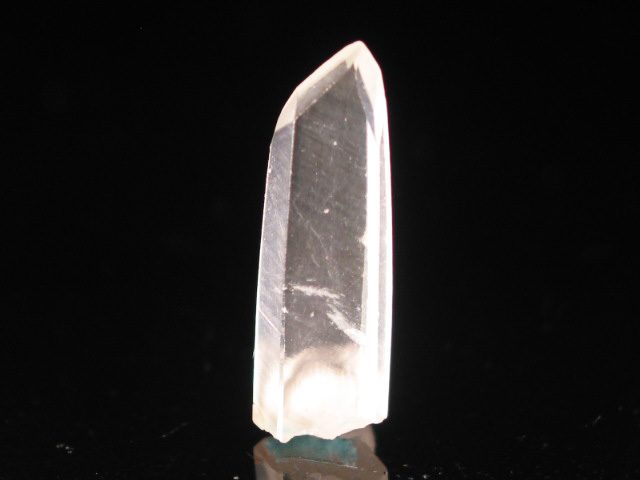 An elongated crystal of thorite from Mogok. 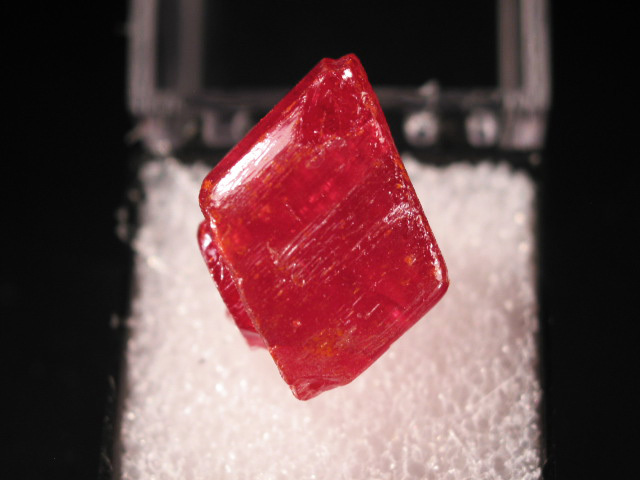 This locality is best known for its gem species (rubies, sapphires, spinels, etc.) 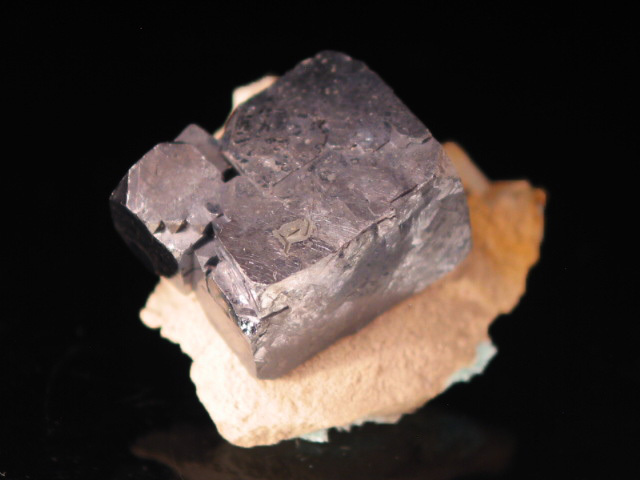 but is also the source of a number of interesting rare species, including rare earth bearing minerals. 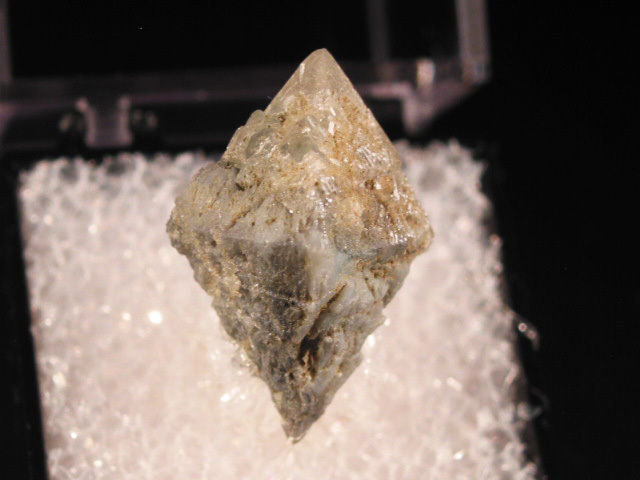 This is a good, terminated thorite crystal, the only other locality you are likely to see decent crystallized samples of this thorium silicate from, is the Kempf Prospect in Canada. 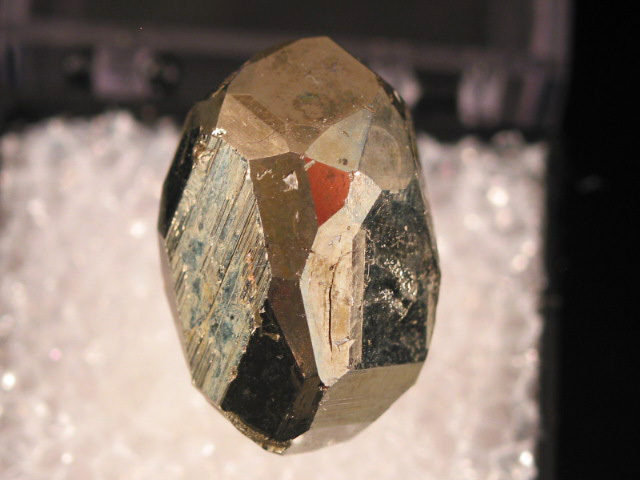 A rare thumbnail example of powellite, scheelite's rarer cousin. 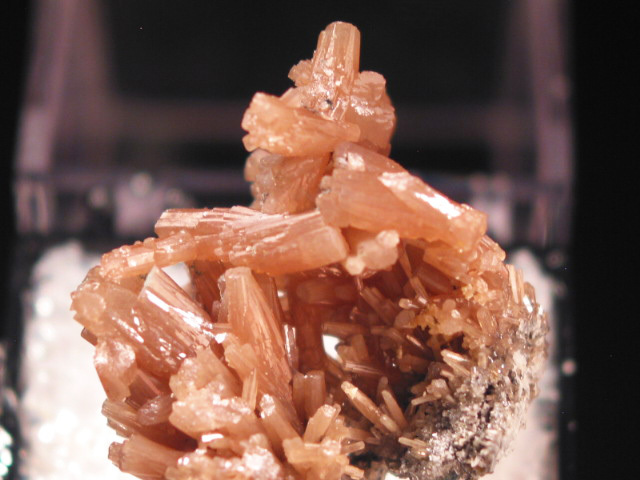 Powellite is one of the rarer minerals from the Indian basalt traps, and though is found in association with zeolites, is not a zeolite itself. 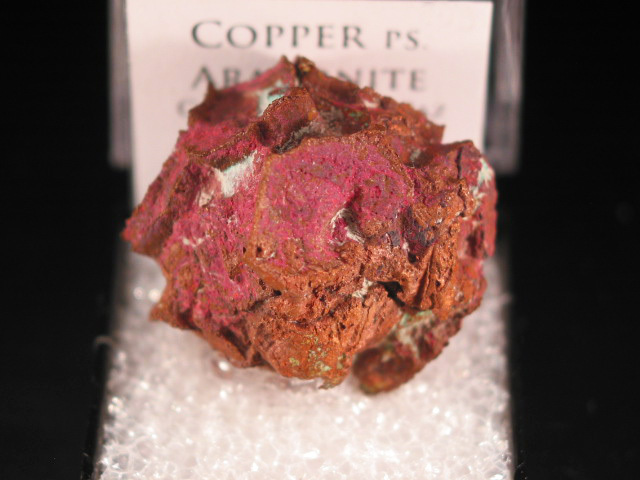 A good thumbnail of this rare copper, silver, arsenic sulfide from Uchucchacua. 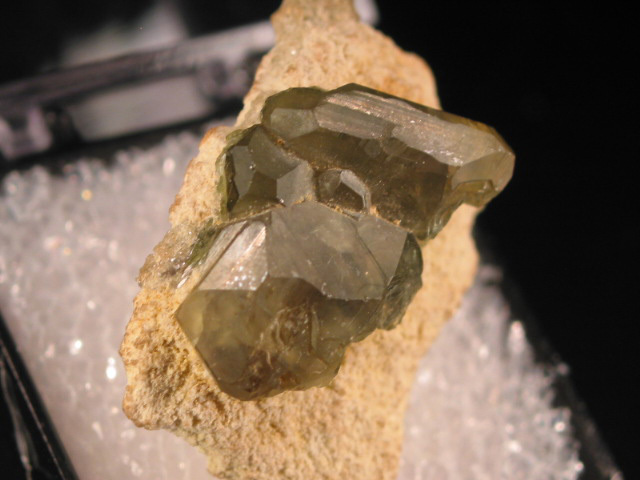 Pearceite is the arsenic rich member of the The majority of these form much, much smaller crystals at this location. 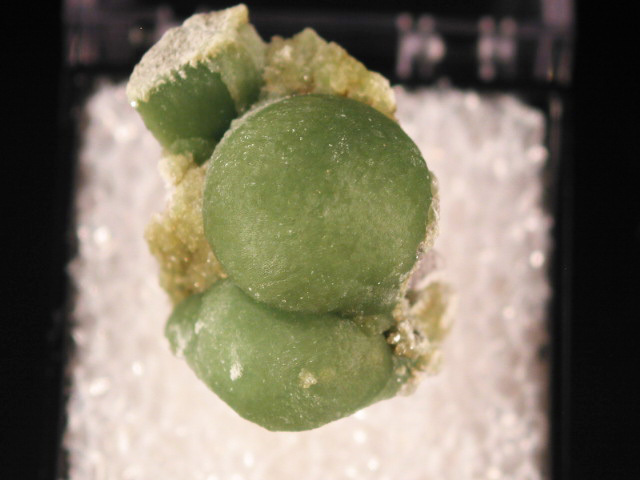 A good thumbnail of V-twinned chrysoberyl from Zimbabwe. 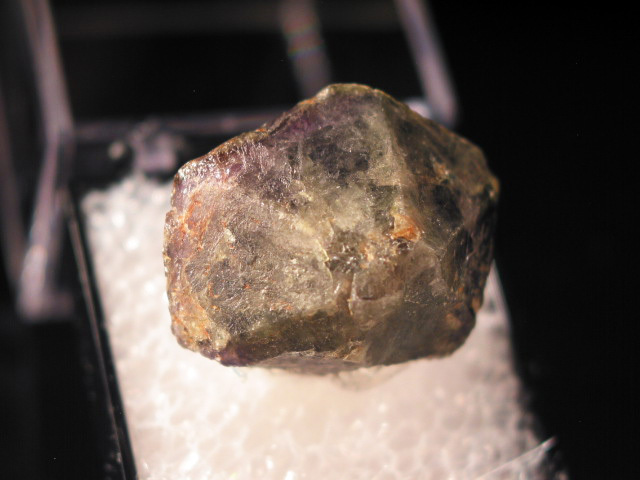 I'm not selling this as an alexandrite, but there is definitely a strong color shift from the dull green to a brighter one when the specimen is observed in incandescent vs. daylight equivalent light. 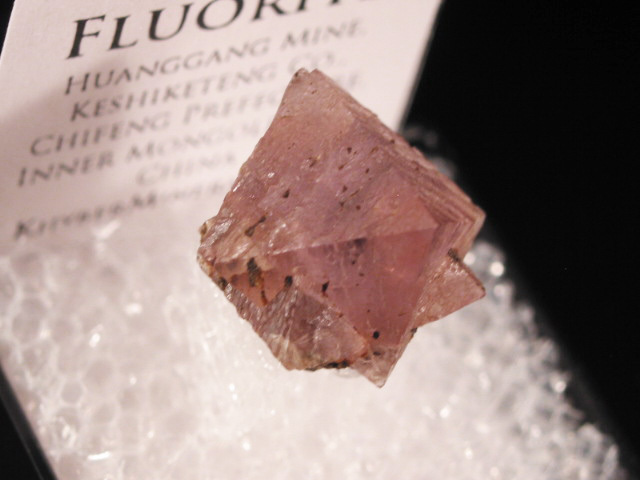 A partial fluorite octaheron, notable mainly because it is from an unusual locality for the species-- Mogok is known for amny minerals, but fluorite is not one of them. 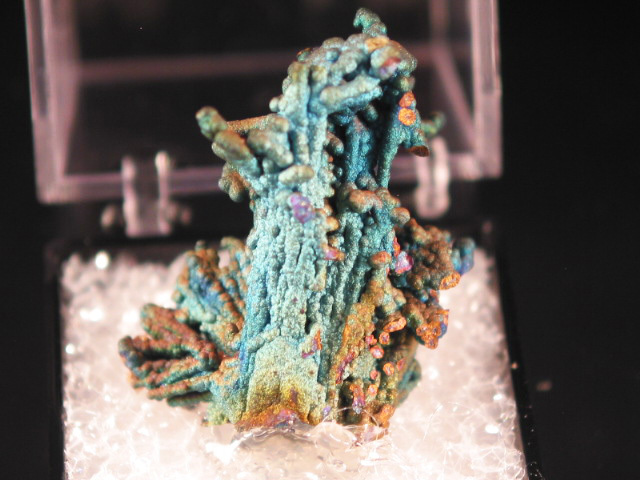 I have only seen a few examples of this material. 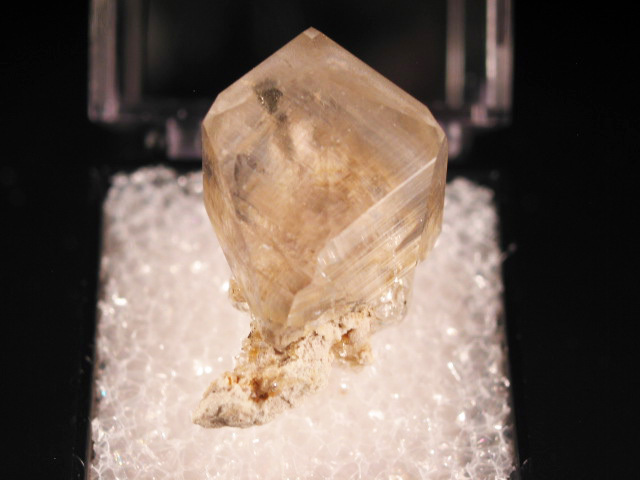 A nice (older) example of reticulated cerussite from Morocco. 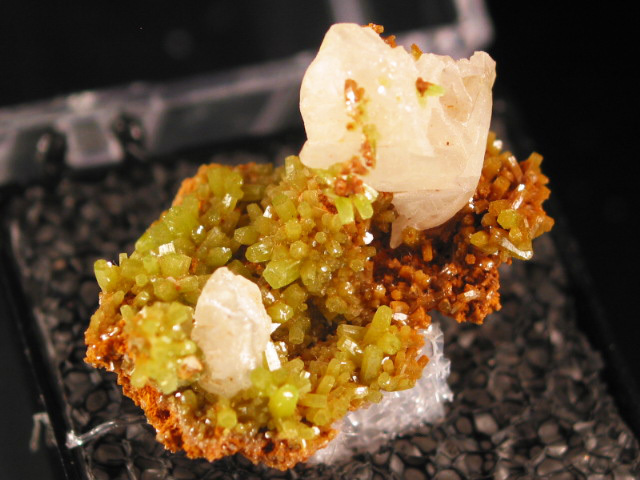 San Jose mine, Oruro City, Cercado Province, Oruro Department, Bolivia. 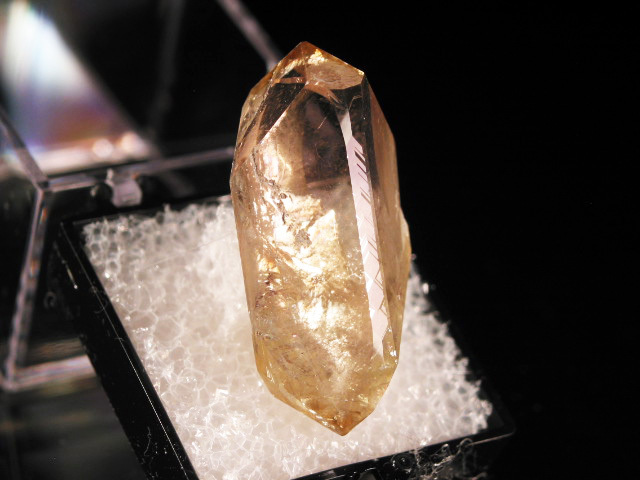 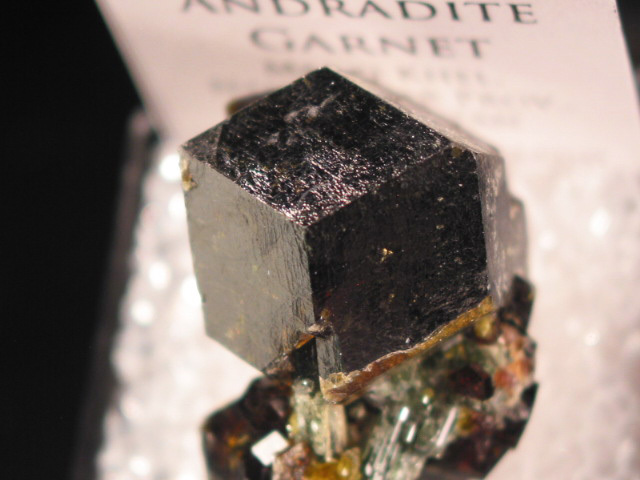 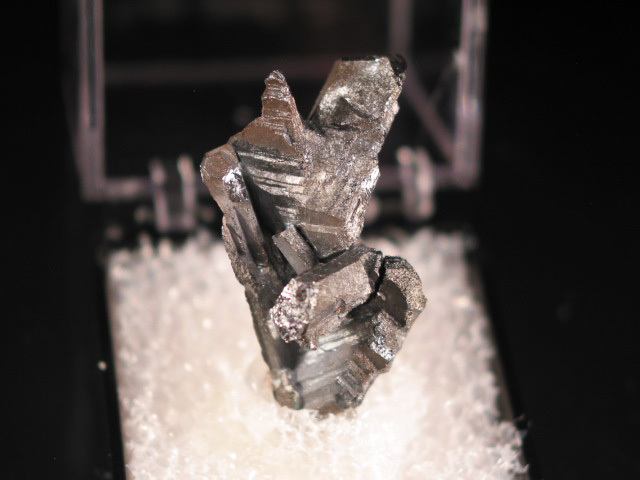 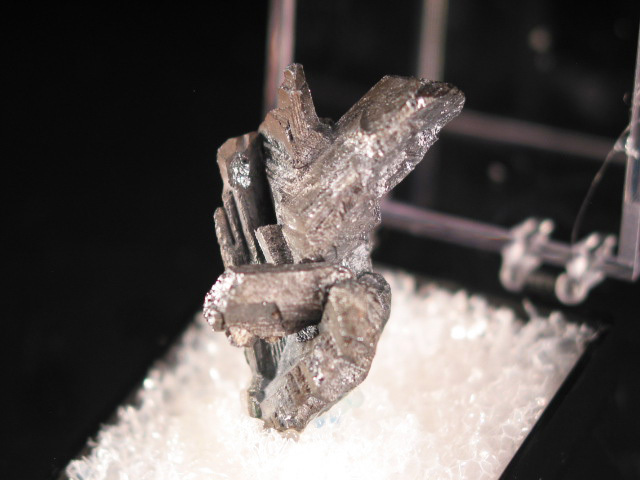 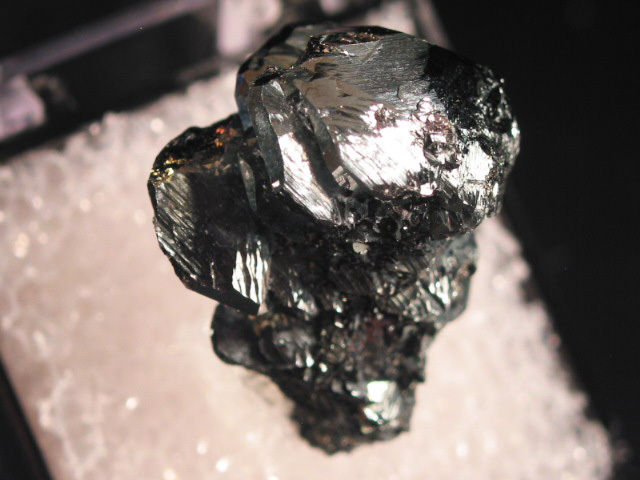 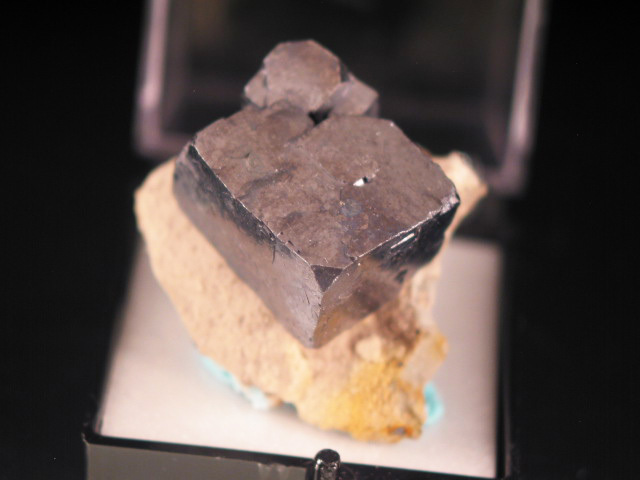 A crystal of this rare franckeite variety clearly visible in a matrix of smaller (regular) franckeites. 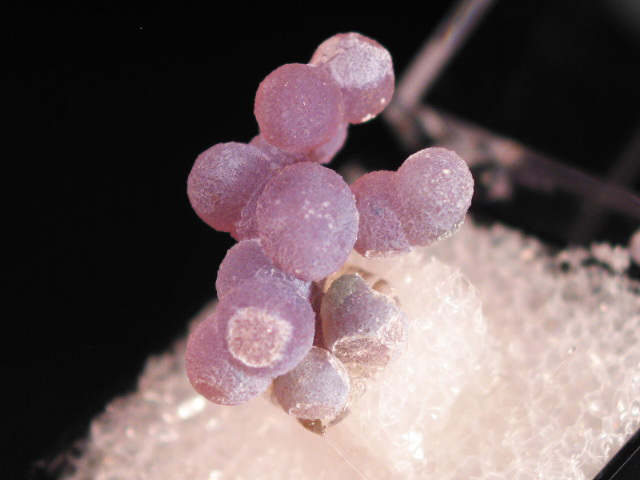 It was originally thought to be a separate species, then reclassifies as a variety of franckeite. 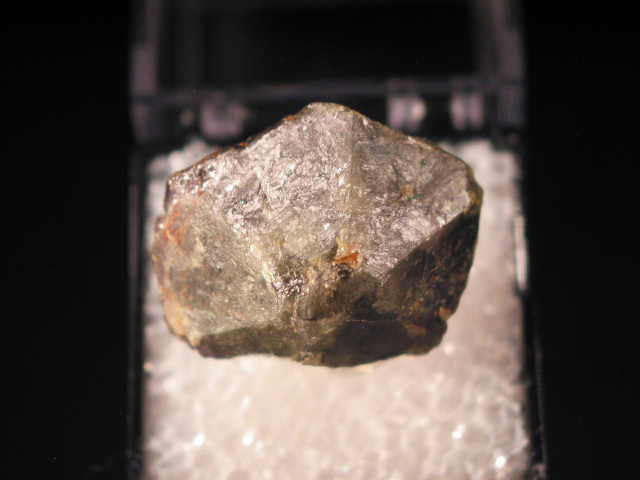 A nice thumbnial sized sample of a "herkimer diamond" on matrix. 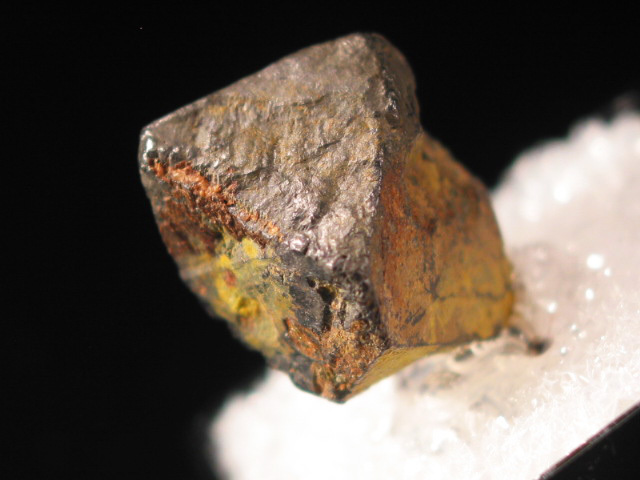 They tend to pop off their host rock, so finding matrix examples is a bit harder. A nice apple green thumbnail of twinned titanite from Alchuri, in Pakistan's far northern areas. 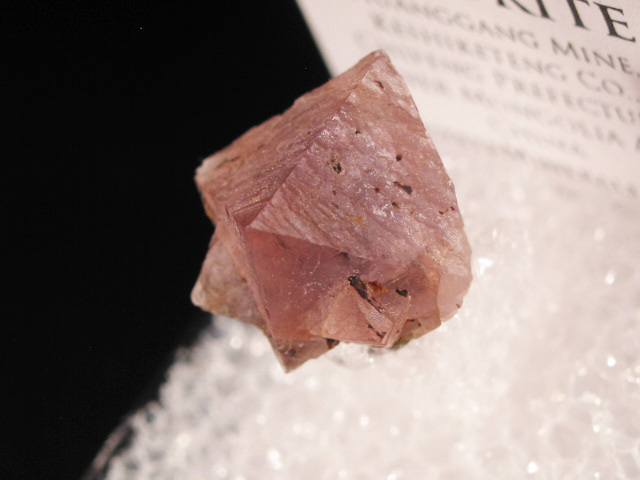 A nice little thumbnail of pink fluorite from Inner Mongolia. 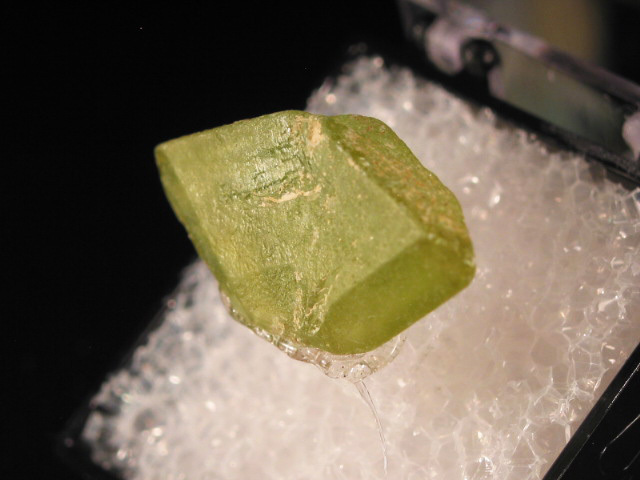 An excellent thumbnail example of demantoid garnet from a locality situated in one of the most politically "hot" provinces in the region. 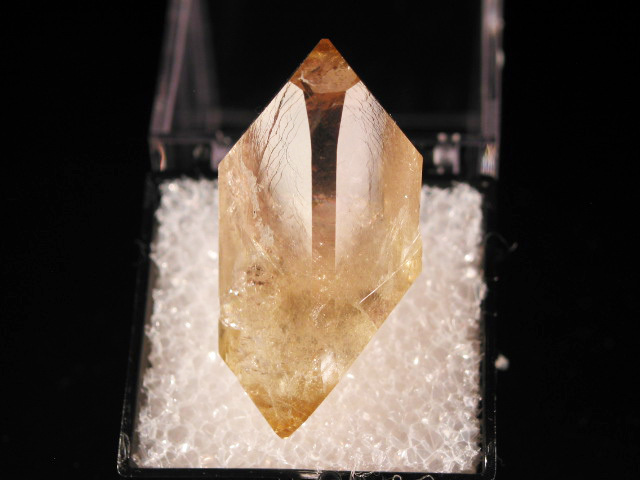 This one is well balanced, with a very sharp and lustrous crystal nicely positioned front and center. 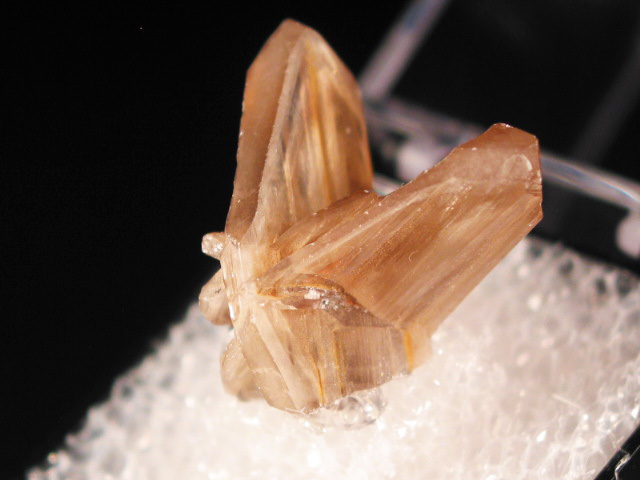 A nice (and older) cyclic cerussite twin from Morocco. 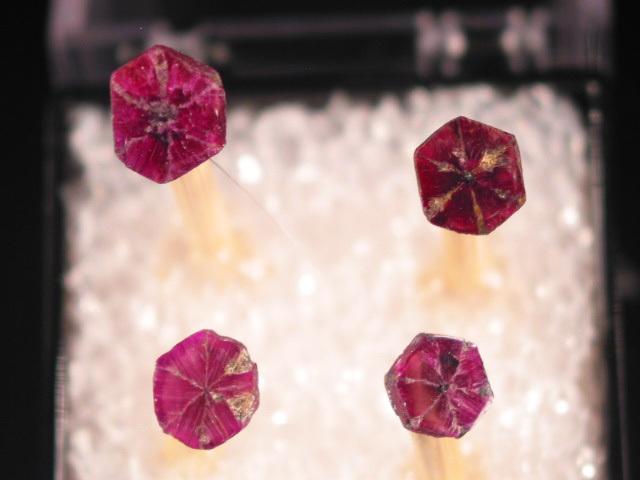 A set of 4 trapiche rubies from Mogok, all have at least one polished face. 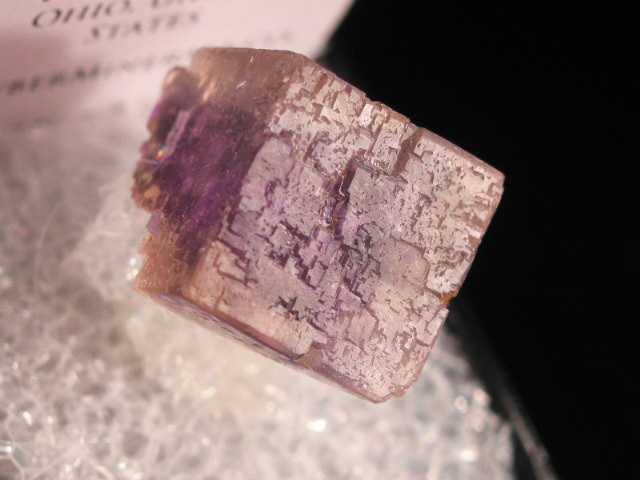 The largest one measures 0.7 cm across the diagonal. 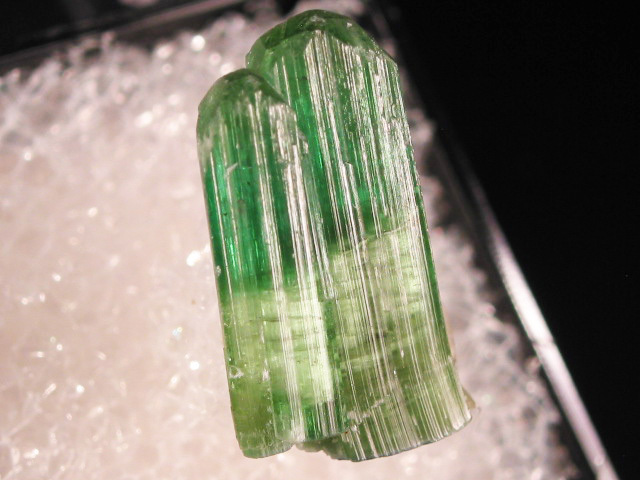 Trapiche emeralds are fairly common, but trapiche rubies are harder to find.